The cards in this gallery are organized into 4 Galleries for faster loading. For specific information on each card you can hover your mouse over the card, or click on any card to go into slideshow mode (which will also offer you a larger image with the caption underneath). All cards are from the Fleischer Family Collection. Max and Dave Fleischer were the brothers and pioneers in early film work that eventually formed Fleischer Studios. Max was President and Dave was Vice-President. 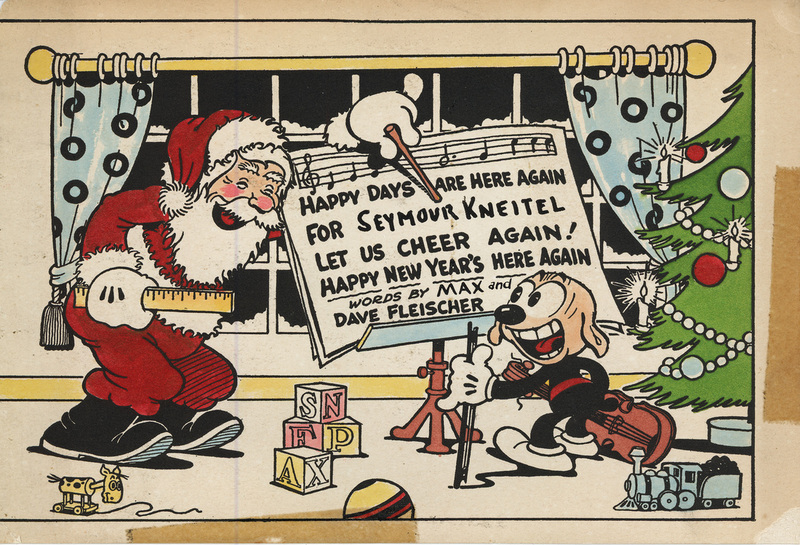 2: This card from Max and Dave Fleischer is personalized to Seymour Kneitel, one of the staff animators. 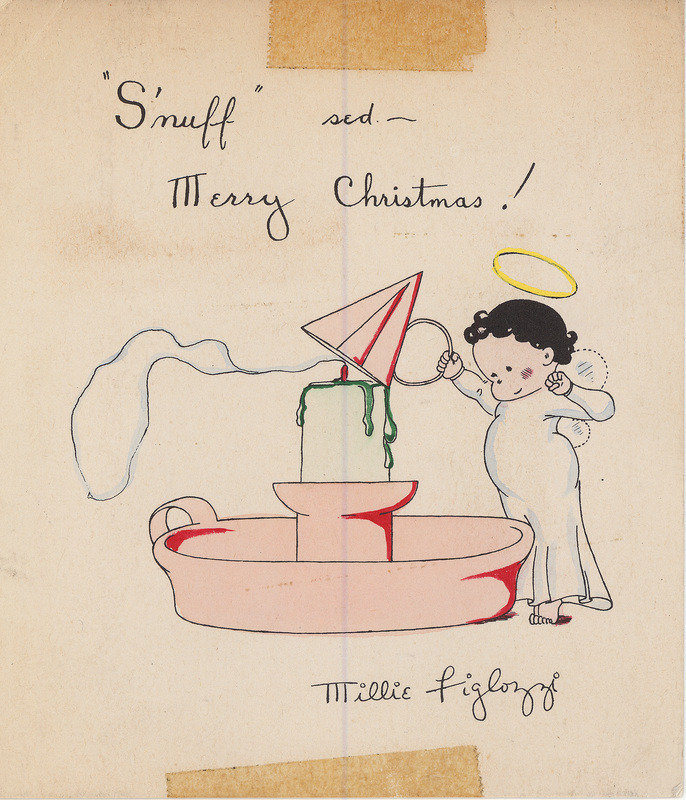 A blank space was usually left on these hand-made cards in order to insert the name of the person it was going to. 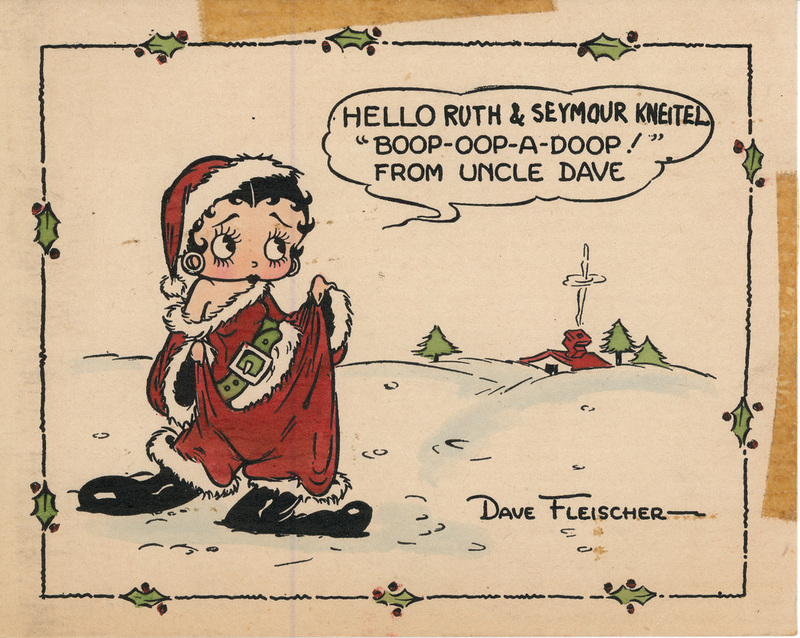 3: This card from Dave Fleischer has the names ‘Ruth & Seymour’ added by hand after the card was printed. In all instances where there is color on a card, the color has been added by hand. 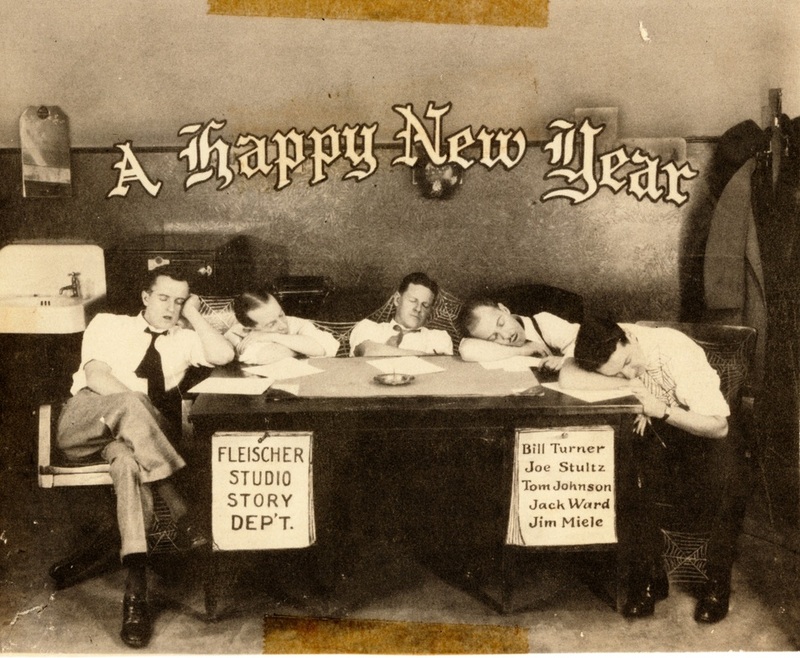 4: Lou Fleischer, the Fleischer brother with exceptional musical talent joined Fleischer Studios circa 1924 and became Head of the Music Department. 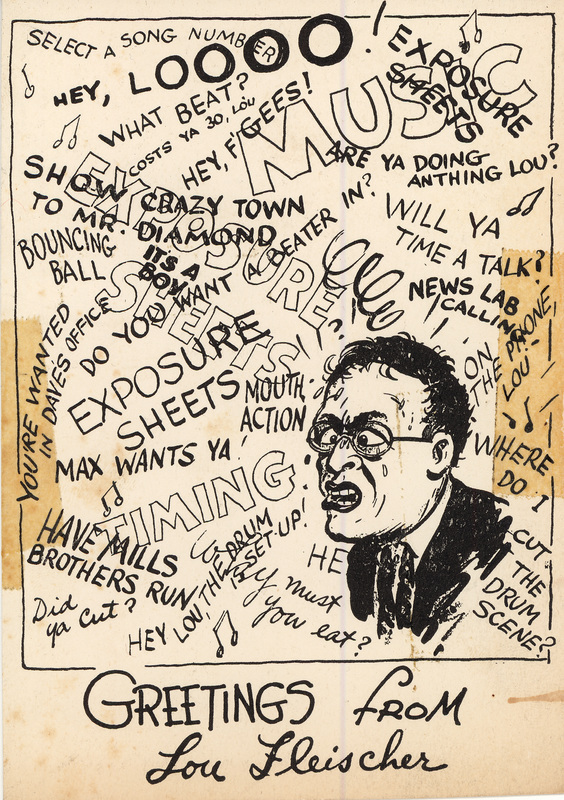 Also an expert mathematician, Lou became the Fleischer’s expert on the use of sound in film. 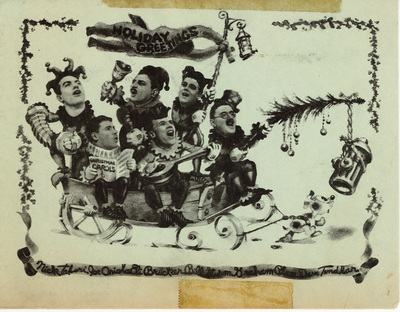 5: Christmas card from the Fleischer Studios Story Department (Bill Turner, Joe Stultz, Tom Johnson, Jim Miele). You have to look carefully to see they have draw cobwebs between each other! 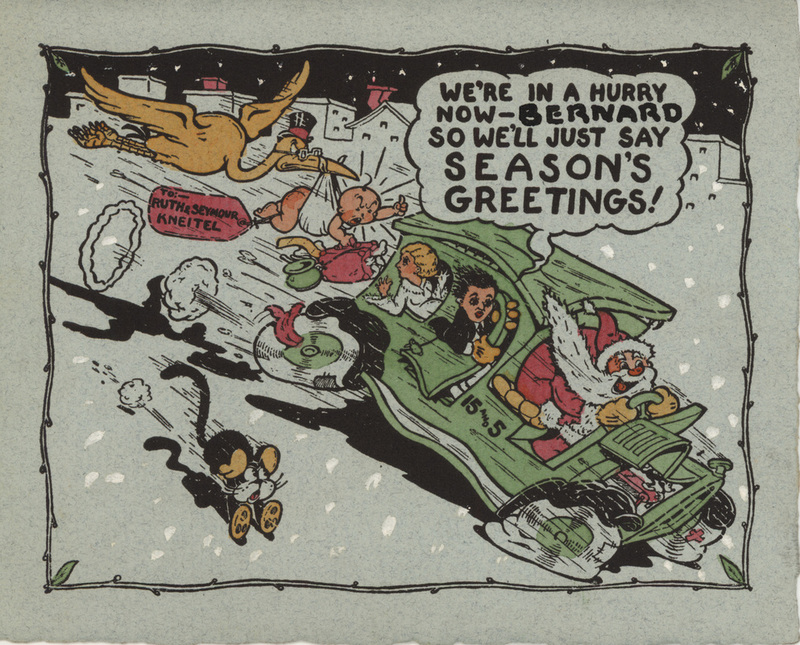 6: Joe Stultz began in the Fleischer’s story department in the l930’s and stayed on to work at Famous Studios. He wrote stories for a wide variety of films including many of the Popeye stories – In later years, after Fleischer Studios closed; he worked again with Max Fleischer as a writer (in 1953) for “Rudolph the Red Nosed Reindeer.” This card circa 1932. 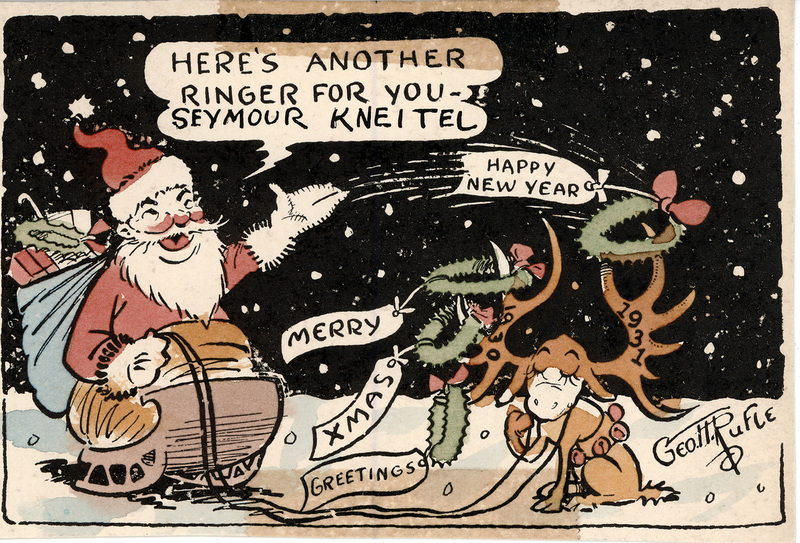 7: Abner Kneitel, a distant cousin of animator Seymour Kneitel, was also an animator at Fleischer Studios (and Famous Studios) from the 1930s to 1944. He met is wife Florence while both were working at the studio, one of many marriages between studio staff. 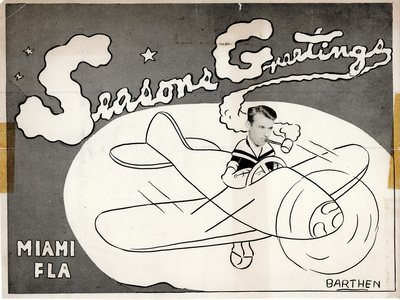 During World War II he served in the US Navy, after which he returned to Florida and ran a gift shop. Card dated 1932. 8: From Jewel and Roland ('Doc’) Crandall. 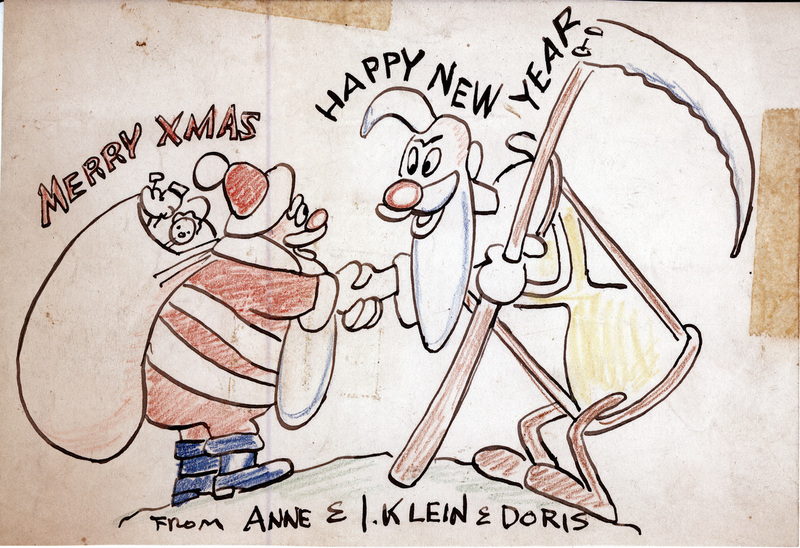 In the early1920’s, as one of the first employees of Fleischer Studios, Doc worked on the early Ko-Ko films. He was probably also the Fleischer’s longest employee…staying with the studio until they closed their doors. 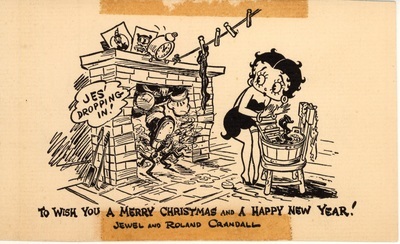 9: This card from Roland (‘Doc’) Crandall and wife Jewell features another major star of Fleischer animated films, Popeye. 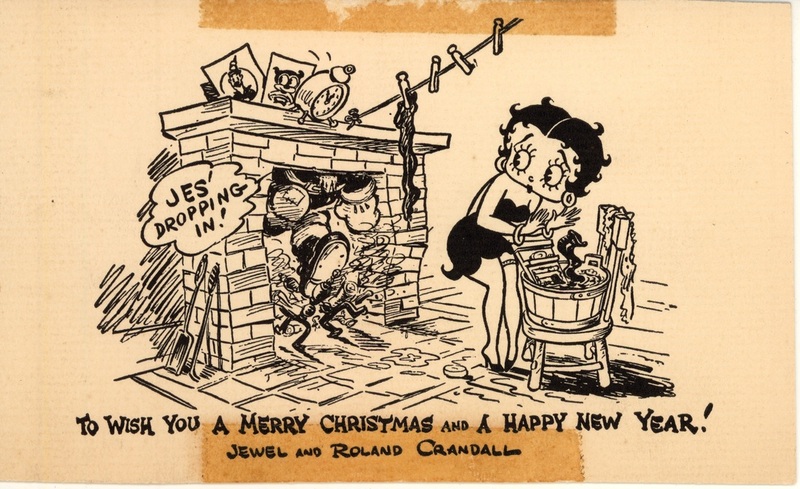 10: Early Fleischer animal characters are featured in this card from Roland (‘Doc’) Crandall and wife Jewell. 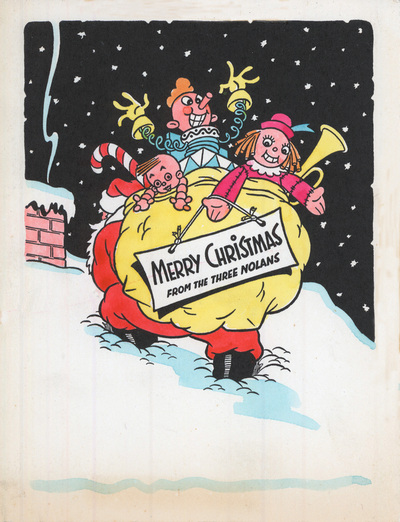 An early version of Bimbo tipping his hat leads the way! 11. 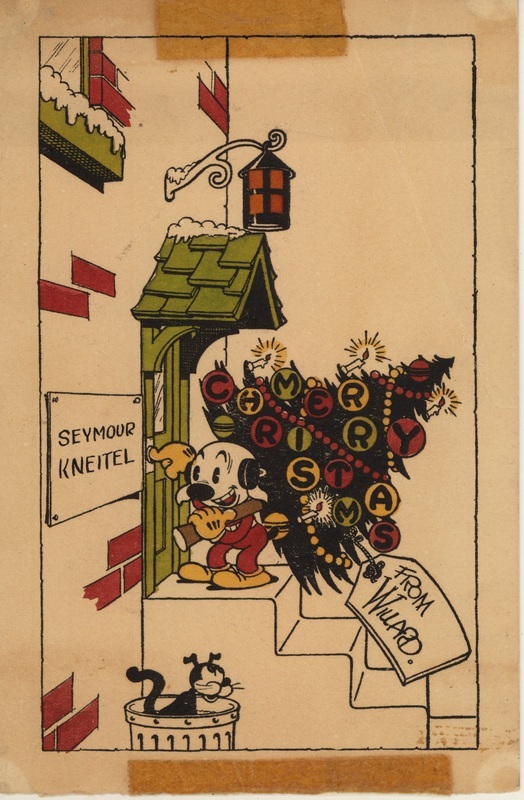 This card is from Roland (‘Doc’) Crandall and wife Jewell. 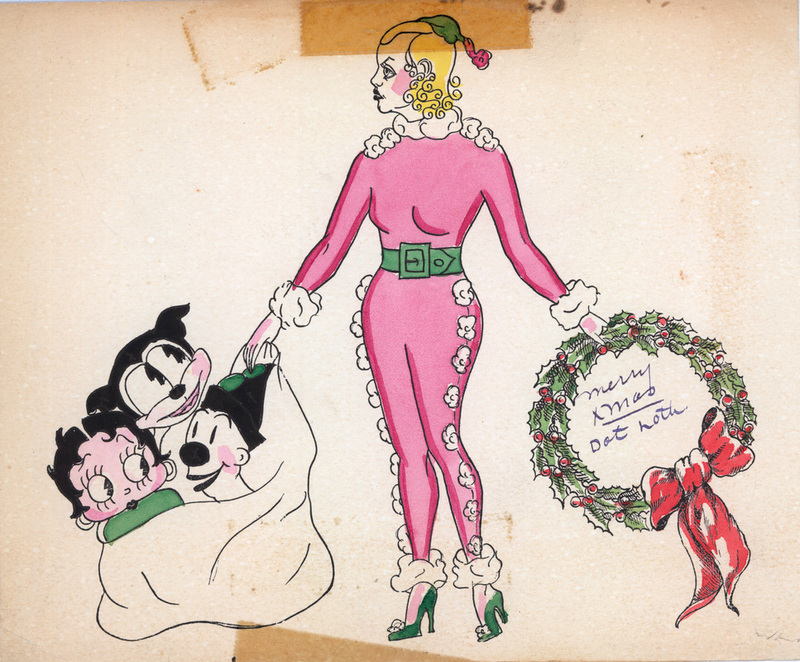 As a reward for years of devotion to the studio Doc was asked to provide all the drawing’s for the Betty Boop 1933 version of “Snow White,” which is considered one of the best animated films ever made. 12: When this card is closed, Popeye’s spinach is viewed through the window and appears to be a Christmas tree….. from Jewel and Roland (‘Doc’) Crandall. 13: This 1937 card from the Roland (‘Doc’) Crandalls features Popeye and company. 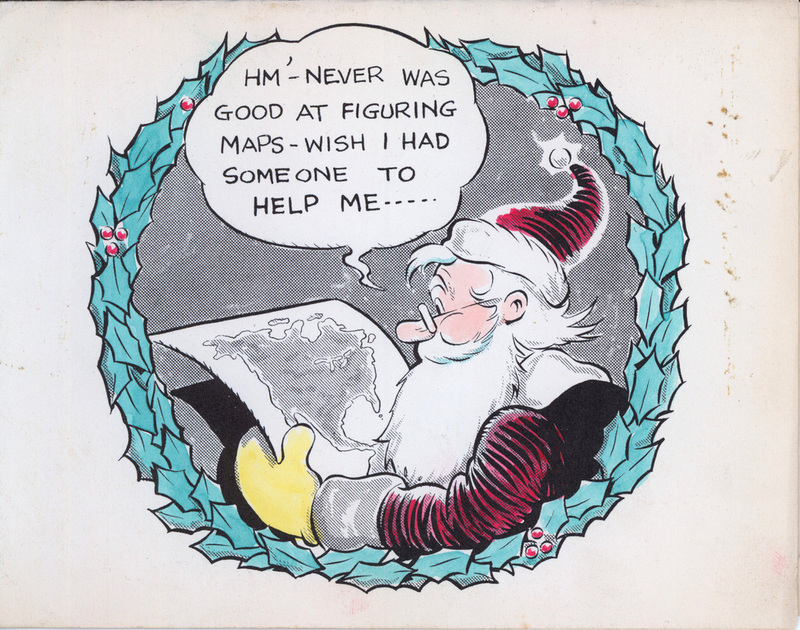 Besides an amazing career in animation, ‘Doc’ had served in the Mexican Border Conflict and with the 11th Engineers in the French front during World War I, and in World War II he was active in the Coast Guard Auxiliary. 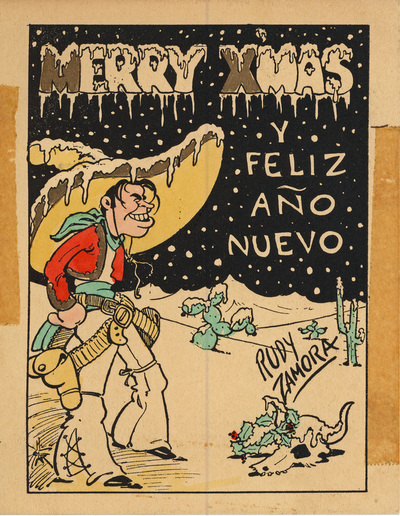 15: In 1928 Rudy Zamora started working at Fleischer Studios. 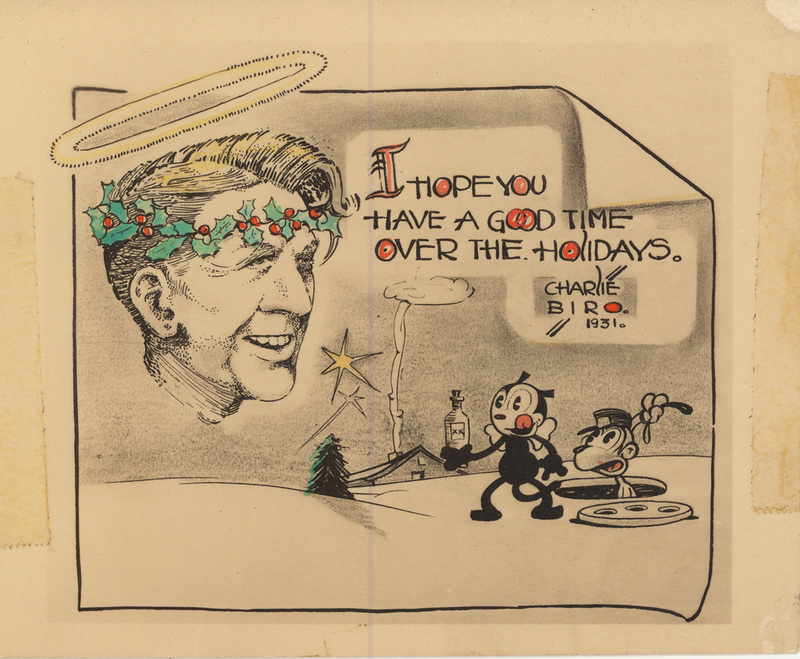 His animation included Bouncing Ball Screen Songs and early Betty Boop films. 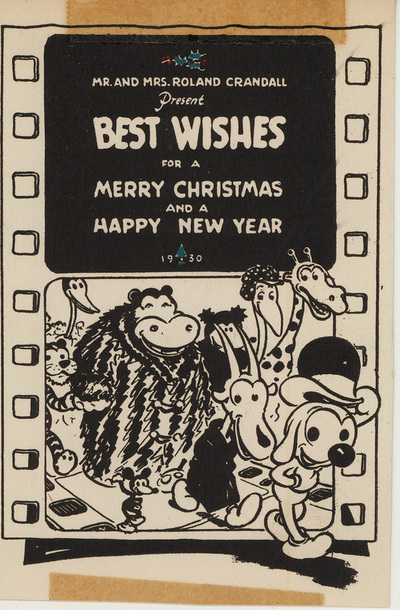 In 1931/21 he left Fleischer Studios and worked at an incredible succession of studios that included Disney, Lantz, Bullwinkle, Hanna Barbera, and many others! 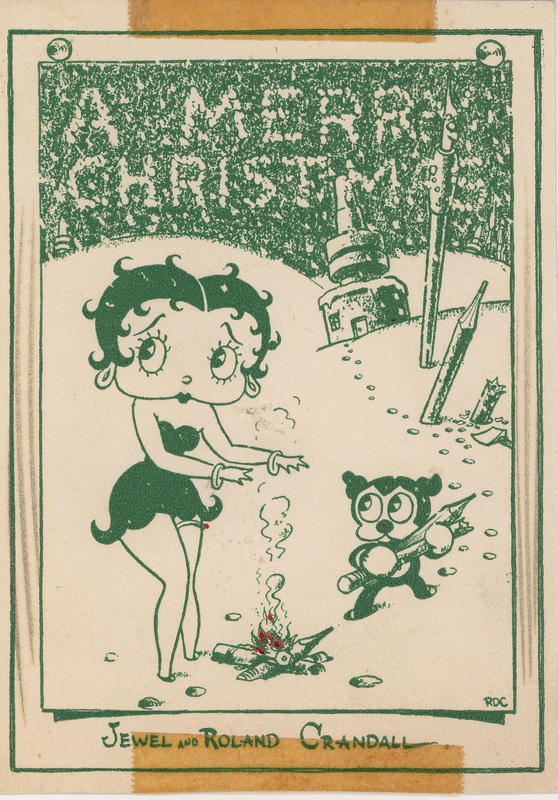 16: This slightly provocative 1931 card featuring Betty Boop is by animator Willard Bowsky. 17: This card featuring Betty Boop was made by Willard Bowsky. Willard began working for Fleischer Studios in the late 1920's, and in 1930 was promoted to animator. 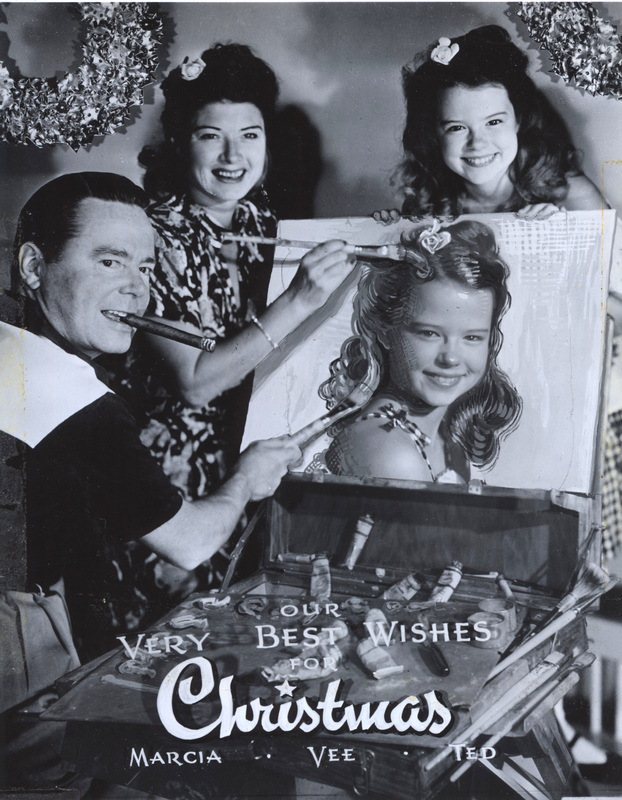 He left the studio (which had recently become Famous Studios) in 1942 to enlist in the U.S. Army. Willard died in action Nov. 1944, in France, at the age of 37. 18: This card from Willard Bowsky, with an early version of Bimbo knocking on the door, has the name of the person destined to receive this card cleverly located on the door sign. 19: Nick Tafuri earned his first credit as an animator working on a Popeye cartoon for Fleischer’s in 1934. He stayed with the studio through it's moves between New York and Florida, and was still working there when its successor organization, Famous Studios, closed in 1957. 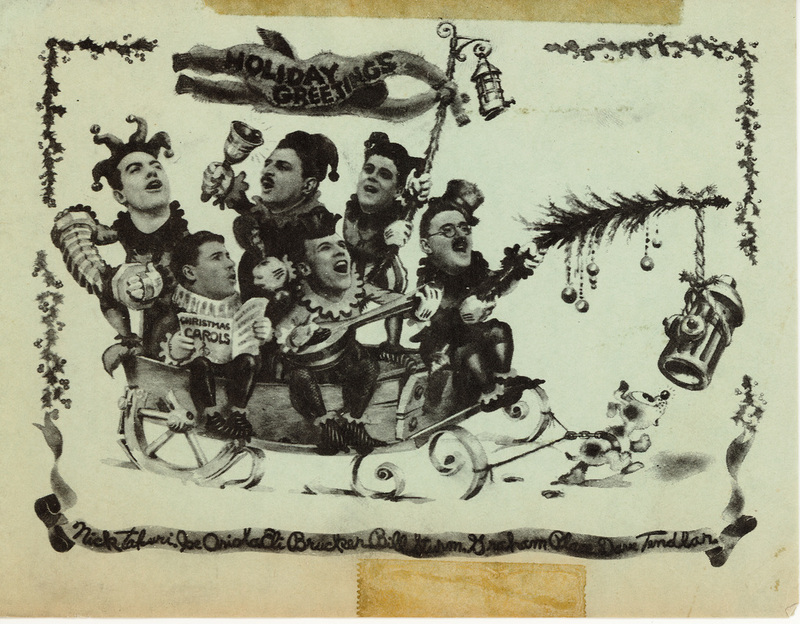 20: A group card from Fleischer Studio staffers: Nick Tafuri, Joe Oriolo, Eli Bricker, Bill Strum, Grahm Place, and Dave Tendlar. 21: In 1935 Jeff Price was working in the Planning department at Fleischer Studios. 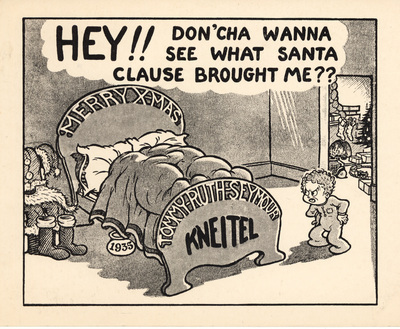 22: Ruth Fleischer (Max Fleischer’s daughter) met her future husband, animator Seymour Kneitel, while both were working at Fleischer Studios. Ruth was head of the Opaquing (painting) Department, and later headed the Inking Department. They married in 1931. 23. Ruth and Seymour met while both were working at Fleischer Studios. 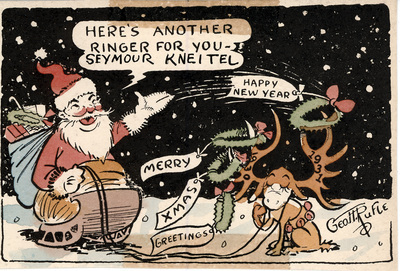 Seymour Kneitel began working in animation at age 16. 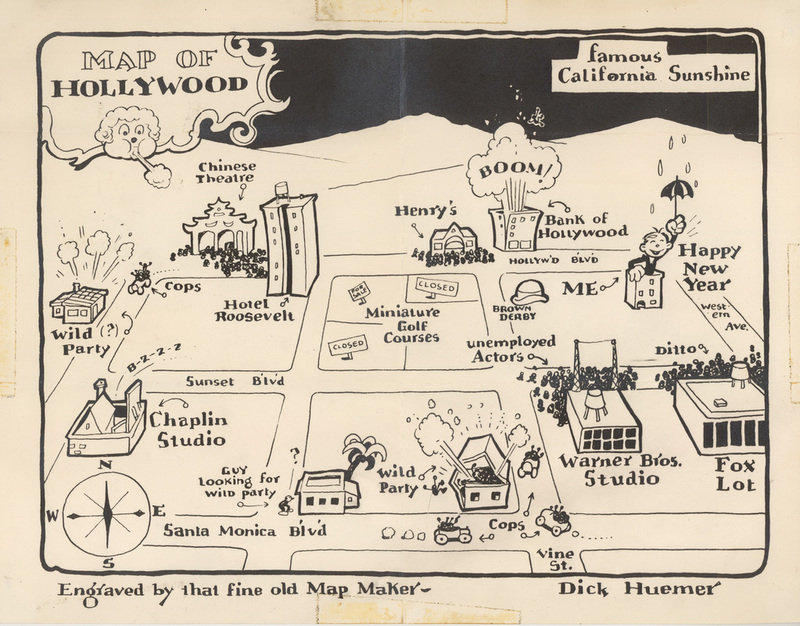 After early training at various animation studios, in 1925 he joined Fleischer Studios, beginning a long career as writer, animator, director of animation-- and together with two partners he managed both successor Studios to Fleischer Studios, Famous Studios and Paramount Cartoon Studios. 24. 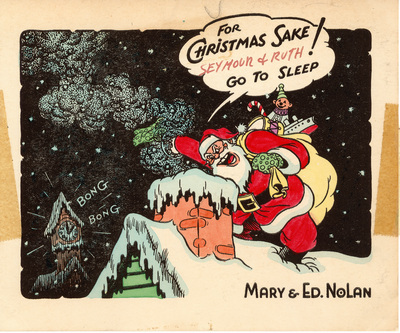 This card from Ruth and Seymour Kneitel showns yet another encounter with a stork deliver. 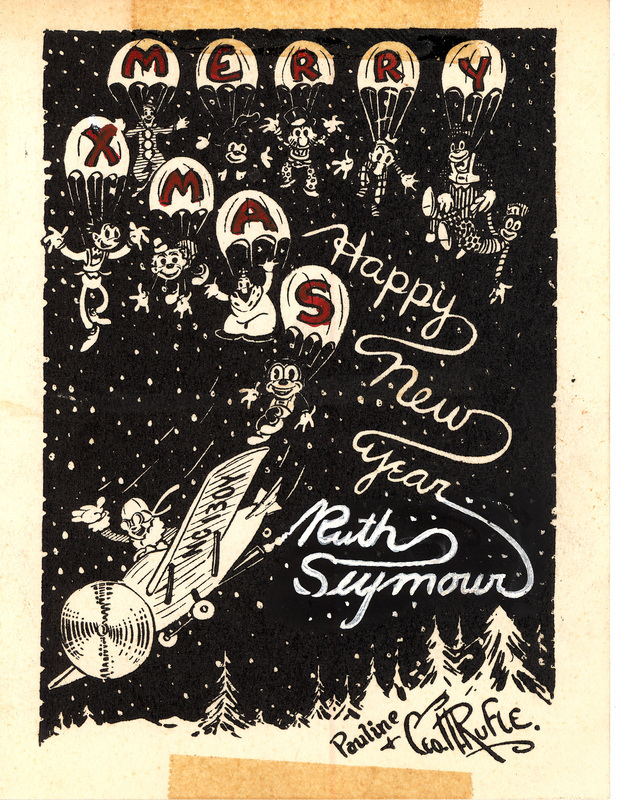 Ruth and Seymour had met while both were working at Fleischer Studios… one of many studio marriages. 25. 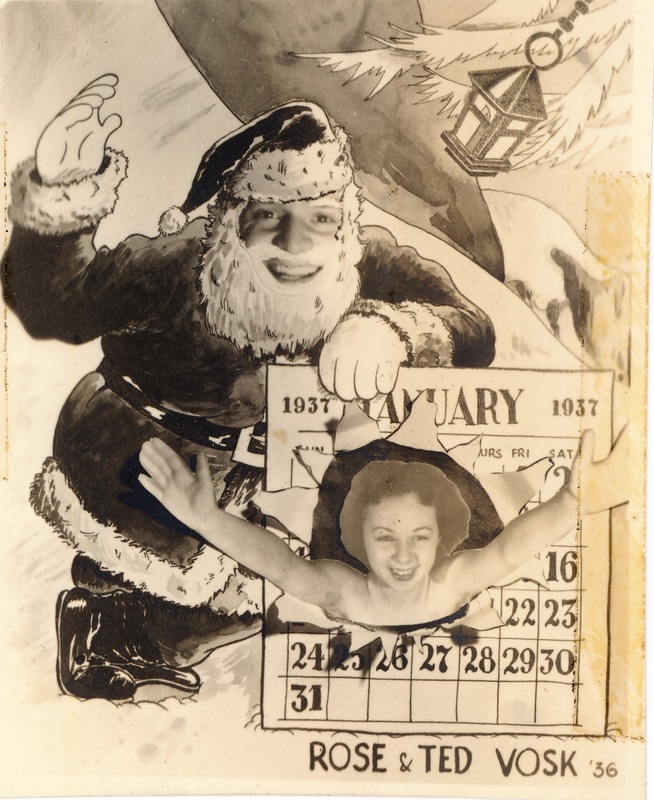 This card from Ruth and Seymour Kneitel shows their young son, Tommy, on Christmas morning. 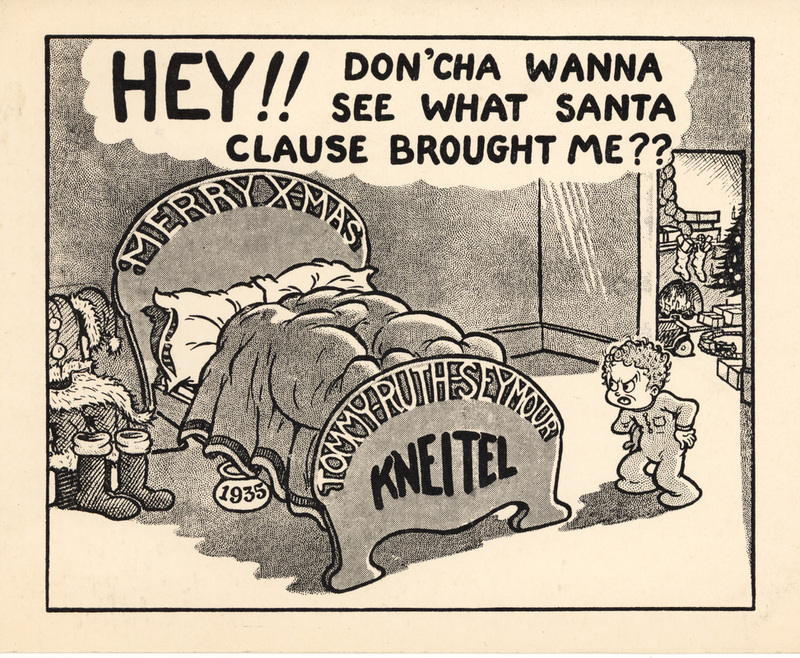 Note the date ‘1935’ on the chamber pot under the bed! 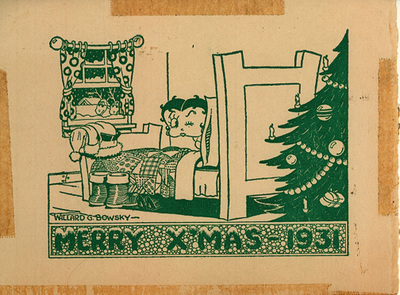 26: Myron Waldman began working in animated films in the mid-1920's. He joined Fleischer Studios in 1930, and by 1935 was promoted to head animator. 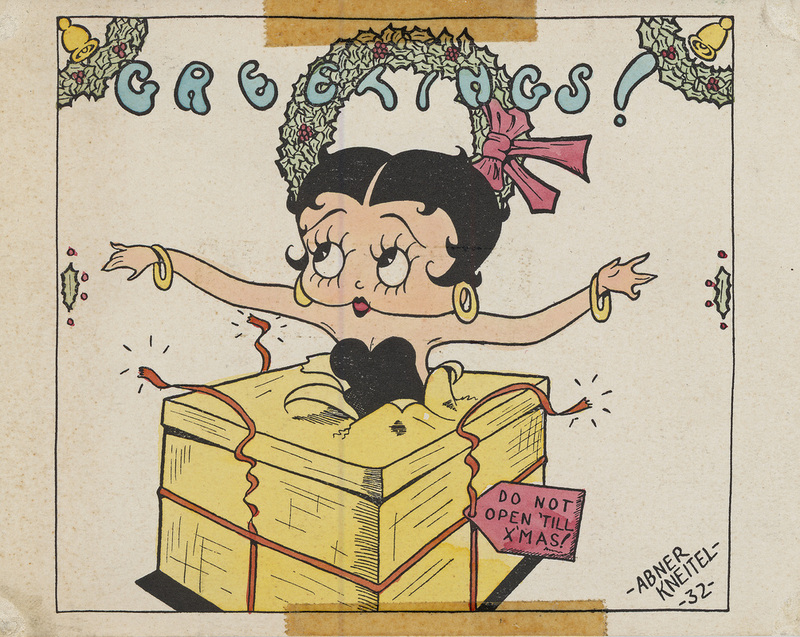 He held the record for working on the most Betty Boop cartoons and was the first to draw Betty's dog, Pudgy. He met his future wife, Rosalie, while she was working as an animation checker. Yet another studio marriage! 27. 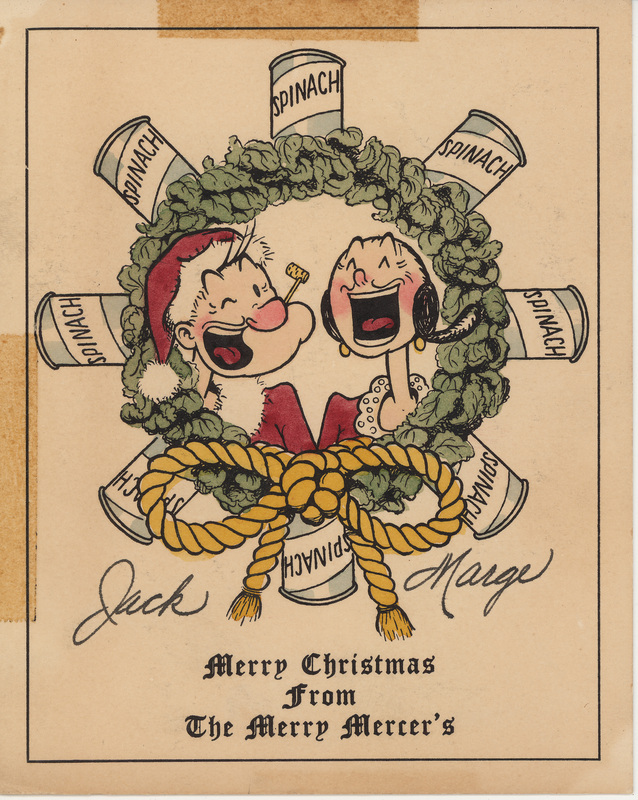 Marge and Jack Mercer were know for their voices in Fleischer films. Margie (Hines) was the very first voice of Betty Boop in 'Dizzy Dishes.' 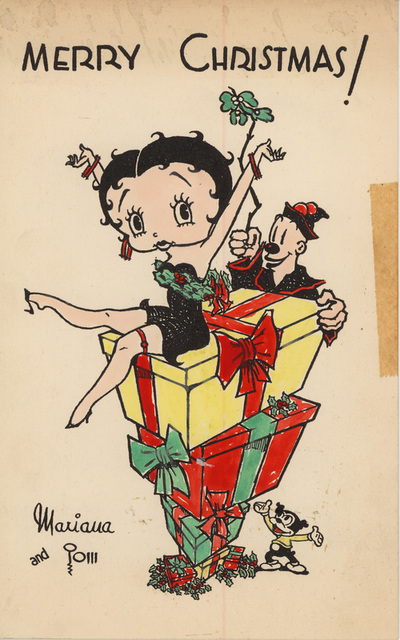 She also did Olive Oyl's voice from 1938-43. 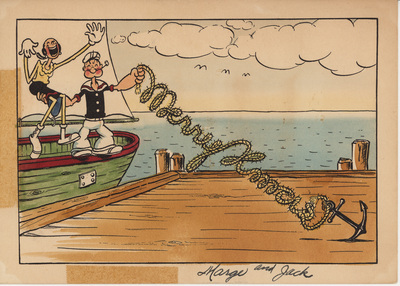 Jack Mercer was know as the long running voice of Popeye. 28. 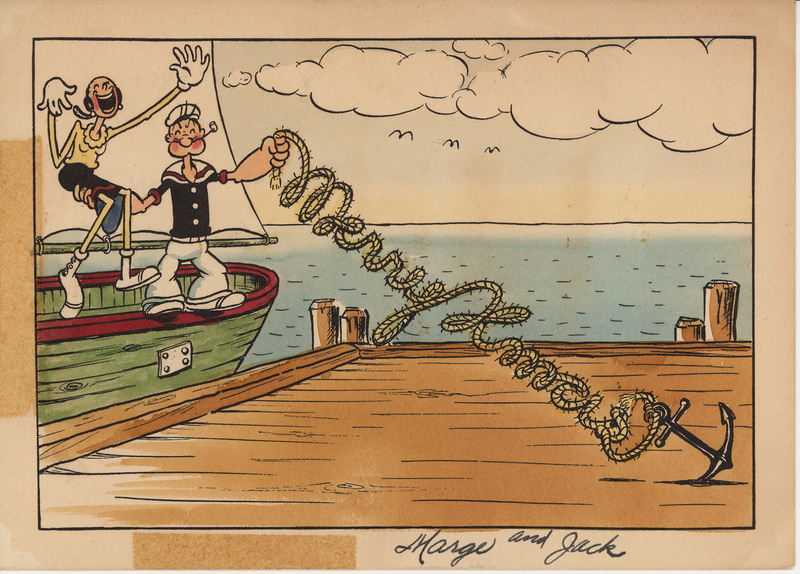 Jack Mercer, originally hired by the Fleischer’s as an in-betweener, began doing Popeye's voice in 1935. He did Popeye and voices for other Fleischer films for many years. 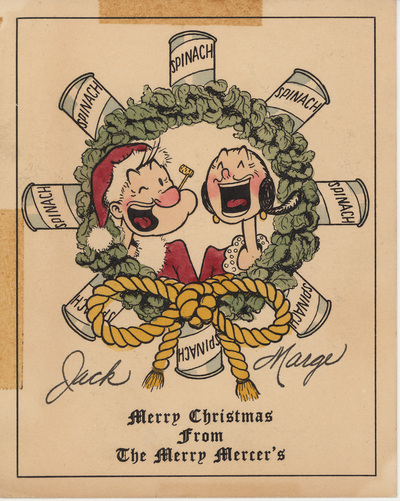 Margie Hines and Jack Mercer were married briefly in the late 1930's/early 1940's. 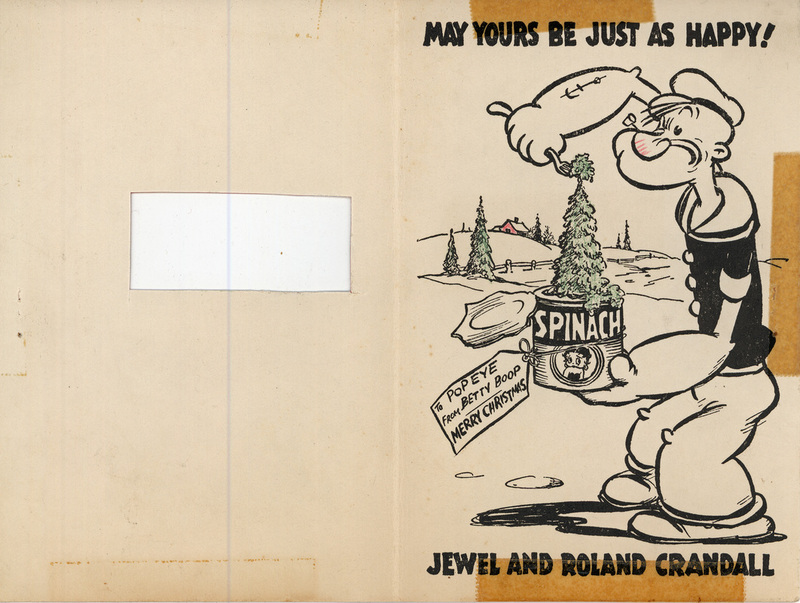 This card with the spinach wreath reflects their long association with those characters. 29. 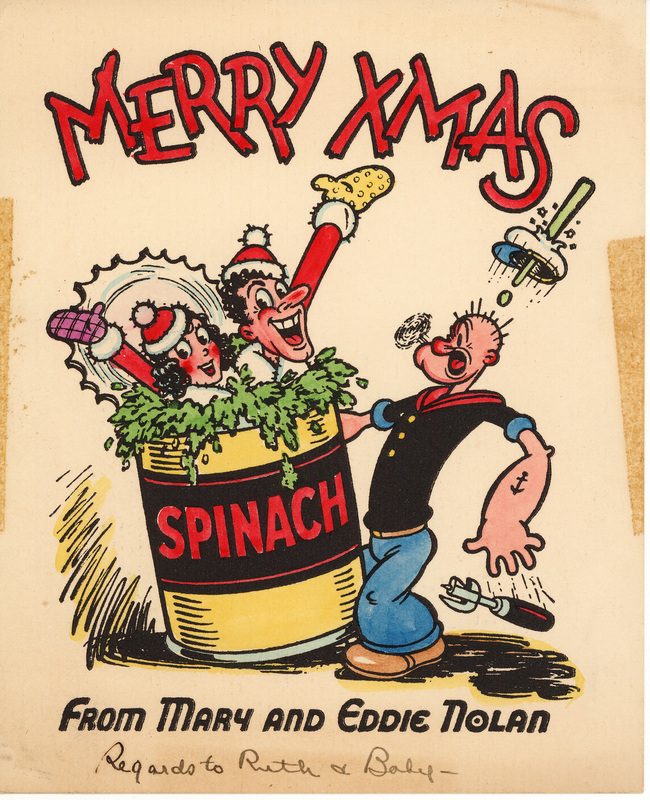 This hand-colored card from Mary and Eddie Nolan features them surprising Popeye as they jump out of a can of spinach. 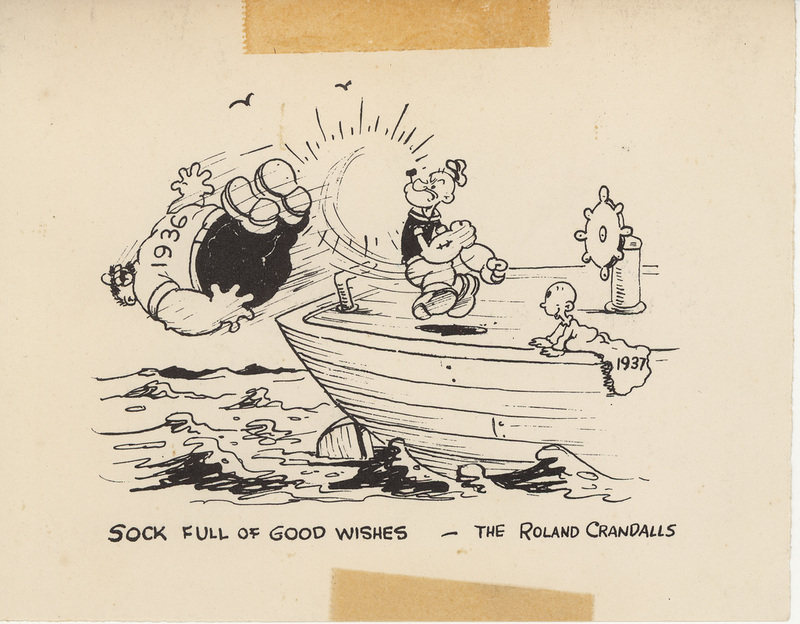 Ed Nolan had worked on a number of the films in the Popeye series. 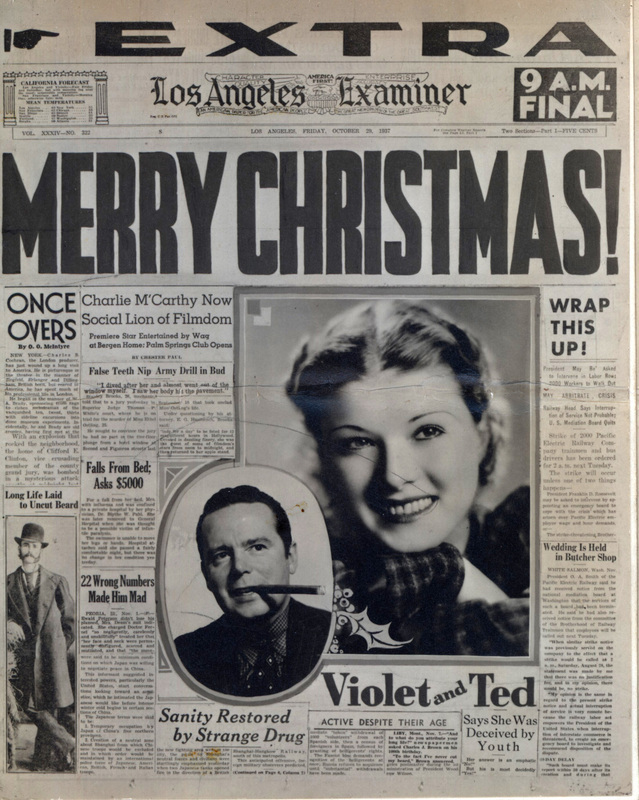 Mary and Ed were another studio marriage. 30. 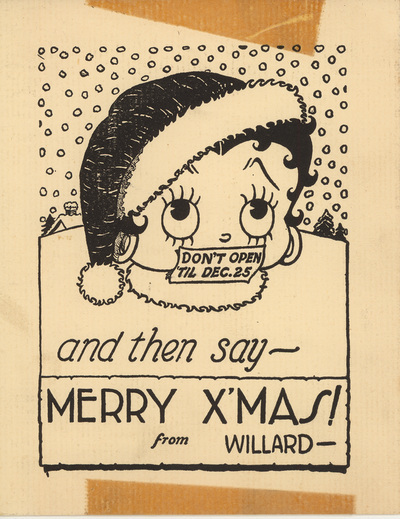 Mary and Ed Noland met while both were working at Fleischer Studios. Ed Nolan had been working on his own independent film series film series circa 1925 before joining Fleischer Studios in the mid1930's. 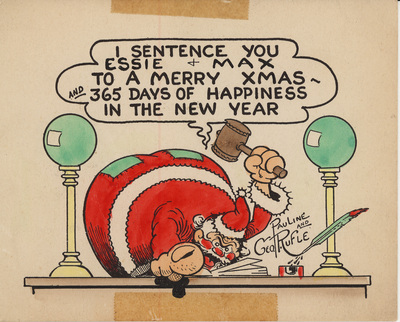 At Fleischer’s his work included a number of Popeye films. 31. 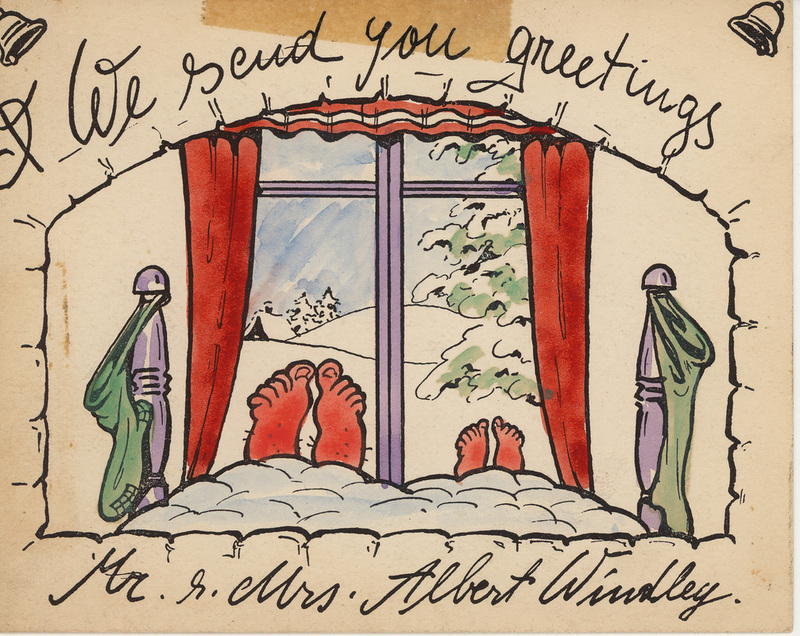 Mr and Mrs Albert Windley. 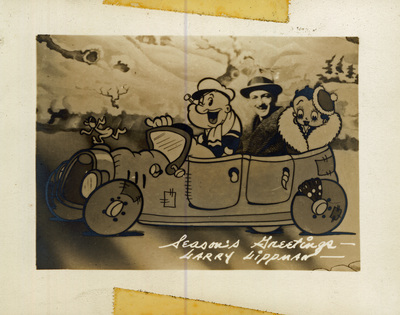 Al Windley was a cameraman for ‘Krazy Kat’ before joining Fleischer Studios circa 1930. 32. 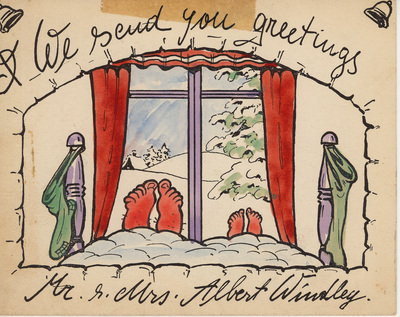 Card from Mr. and Mrs. Albert Windley. 35: This 1930’s card is from Geroge Cannata. 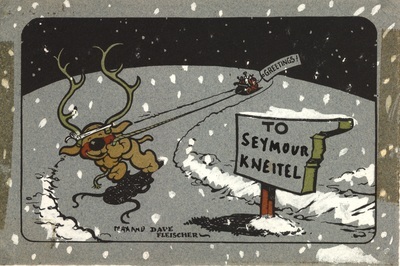 George worked with Fleischer Studios from the late 1920's until 1932. 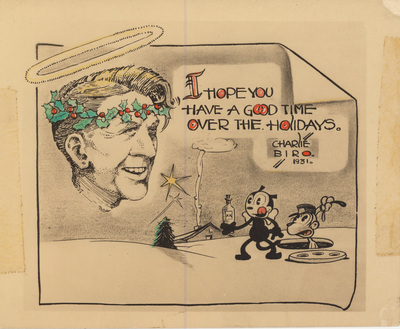 After leaving Fleischer Studios he worked at several other animation studios including Lantz, Terrytoons, Disney, Warners, and in the 1940's Famous Studios. 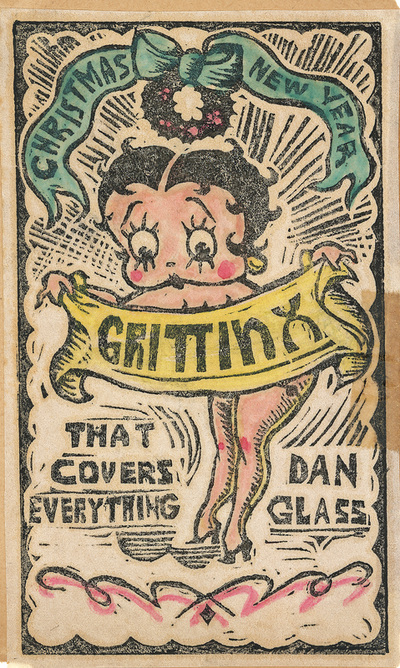 36: Christmas card from Dan Glass dated 1932. 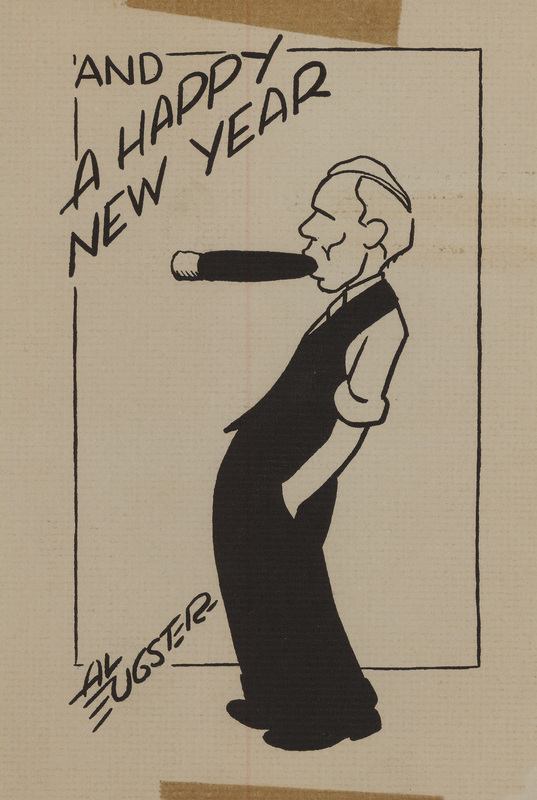 Dan worked as an in-betweener at Fleischers before falling ill. His death in 1935 from TB resulted in the setting up of a Studio Relief Fund for staffers in need of financial assistance. 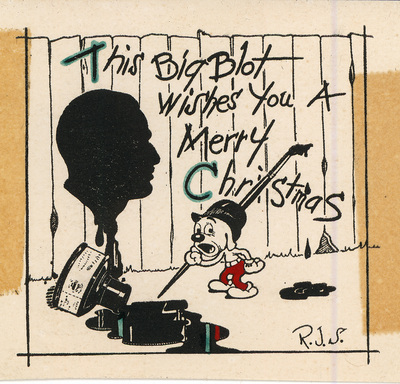 37: This tiny Christmas card (3/4" x 1 1/4") with the message 'Blame It On The Depression!' is from Fleischer Studios animator Herman Cohen. Herman began work at Fleischer's in 1930, and was an animator for the signal corps in WWII before heading to Hollywood to continue his work in animation. 38. Larry Lippman began as an office boy for Max Fleischer. He was eventually promoted and became a planner, checker, and then cameraman. He left Fleischer Studios during WWII to work in the Army Signal Corps as an animation cameraman. Eventually he opened his own company in New York City, working with animation and optical effects. 39. Again, Larry Lippman has placed himself among his friends, Popeye and Betty Boop! 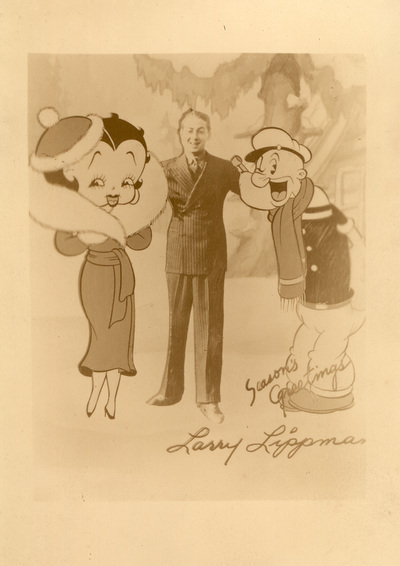 Larry had moved with Fleischer Studios when they relocated to Florida. Before joining the army he also worked for the Jam Handy Organization in Detroit, Michigan. 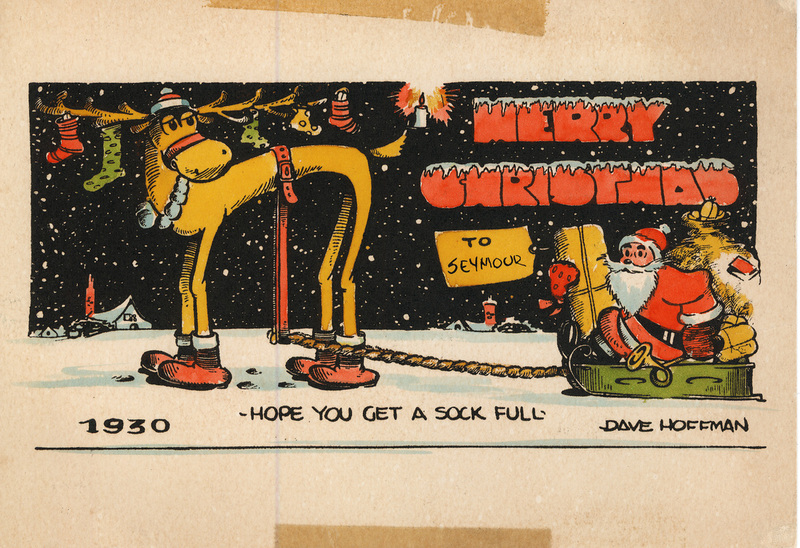 40,41: Christmas card from Fleischer animator Jimmie ‘Shamus’ Culhane (dated 1930). Shamus' first animation job was at age 16 punching holes in paper cells for $12. a week at the Bray Studio. 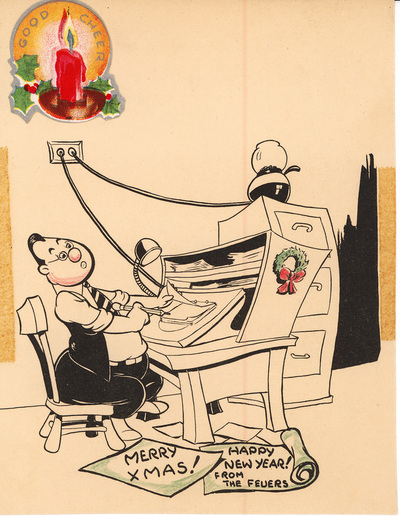 He began work at Fleischer Studios in 1930, where he moved quickly from in-betweener to full fledged animator, contributing to many of their classic cartoons. 41. 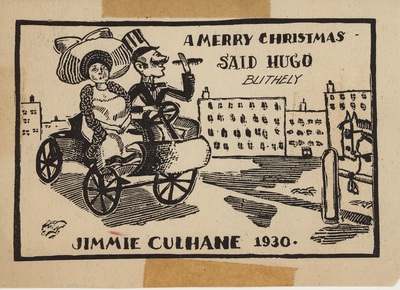 This card from Jimmie (‘Shamus’) Culhane includes Fleischer stars, Betty Boop, Bimbo and Ko-Ko. Shamus is best known for animating Betty Boop's famous hula scene in “Bamboo Isle.” That same dance was re-used in the first Popeye animated film (which was in the Betty Boop series). 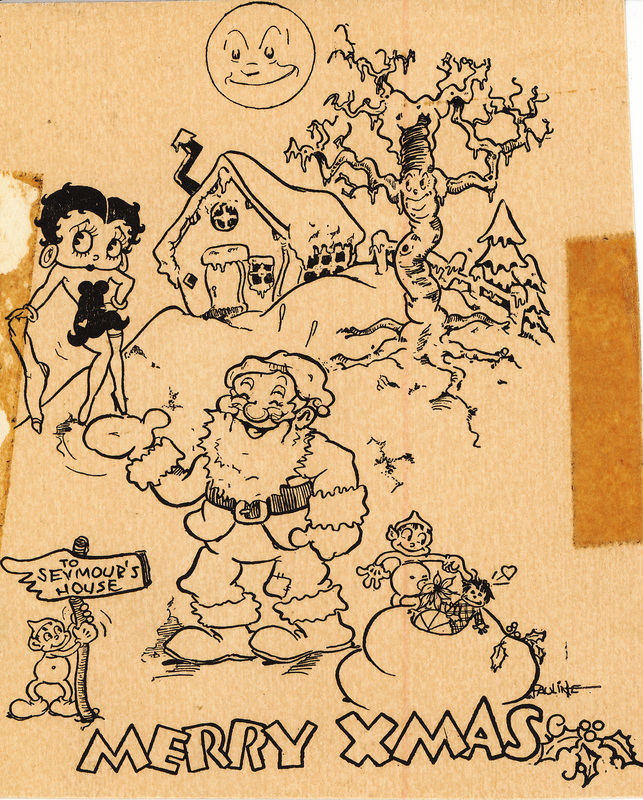 After leaving Fleischer Studios Shamus worked at a succession of other animation studios….. a total of over 18 studios in his long career. 42: Card signed by animator Eli Brucker (not dated). 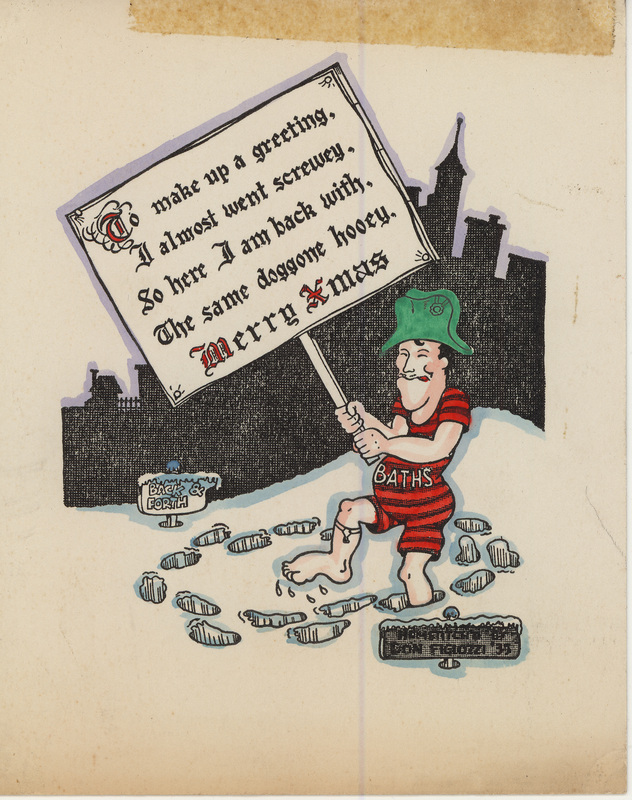 His comment on the bottom…’and a gaggy new year.. refers to the great emphasis there was on creating ‘gag’s in the cartoons. 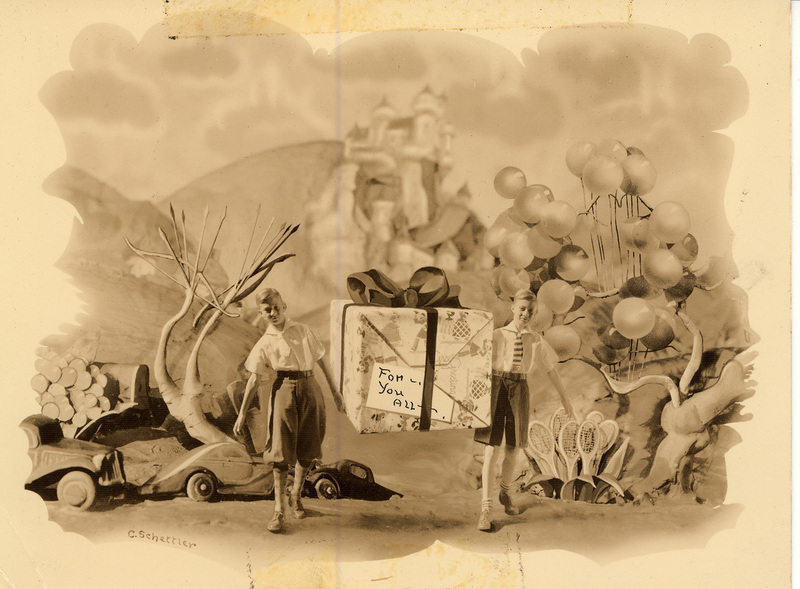 It’s said that the art direction given was that there should be a ‘gag’ in every scene! 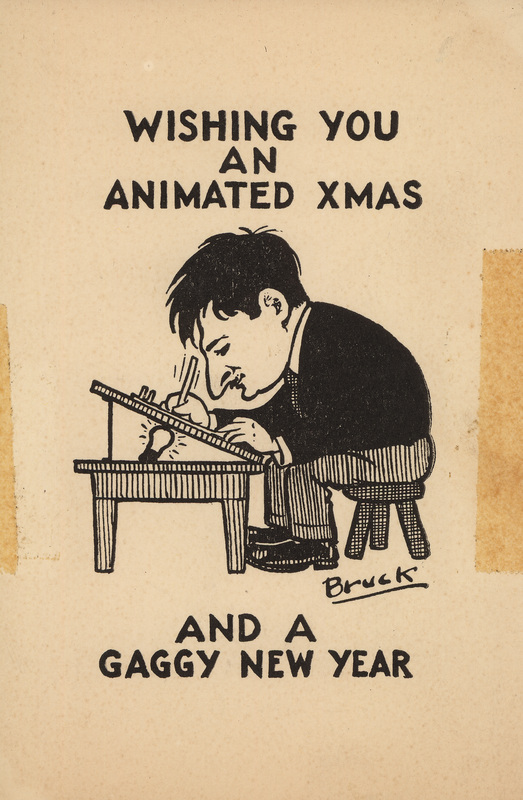 During the famous studio strike in 1937 he was the only animator who would not cross the picket line. 43: From the Bill Sturm family. 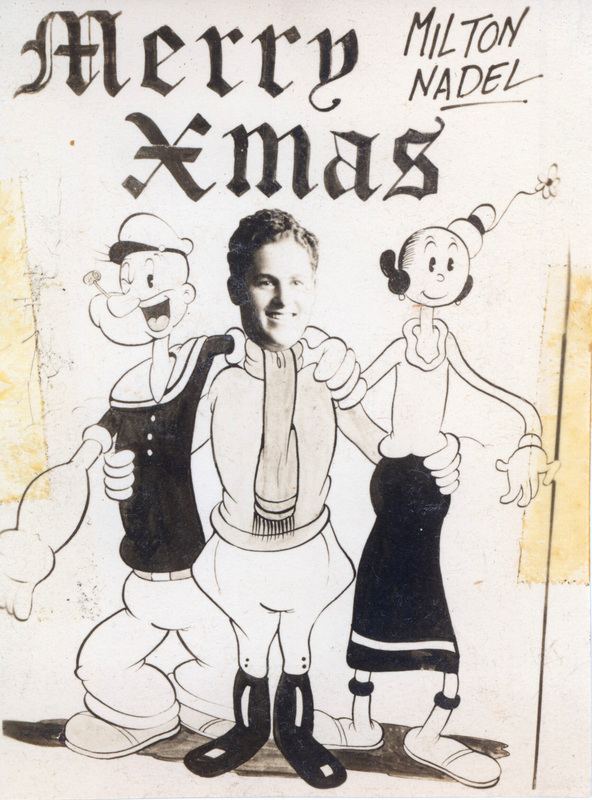 Bill Strum was most noted at Fleischer Studios for character development. 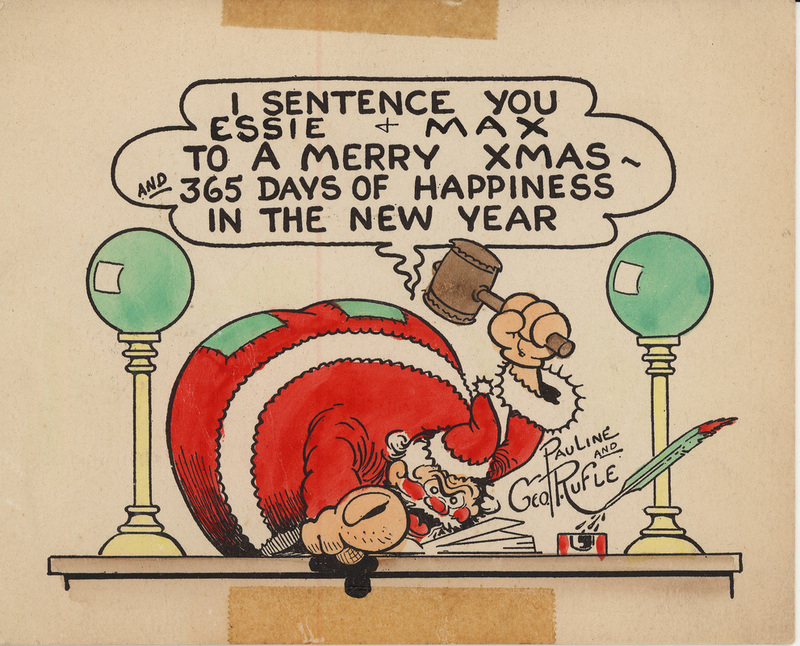 He’s remembered especially for his animation of Popeye and Bluto. 44: This card from Rose and Ted Vosk. 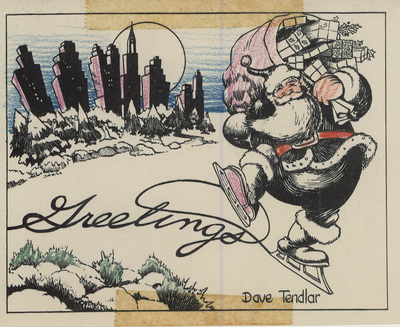 Ted Vosk worked for Fleischer Studios, and later became head animator for The Jam Handy Organization. Dated 1936. 45: Bill Turner worked in the story department at Fleischer Studios and was writer on many films including “Mr. 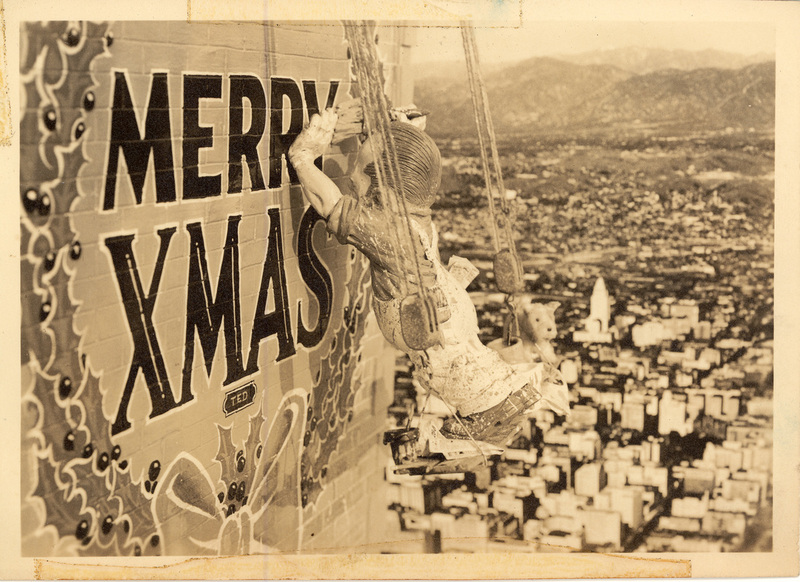 Bug Goes To Town,” “Raggedy Ann and Andy,” as well as films in both the Popeye and Superman series. 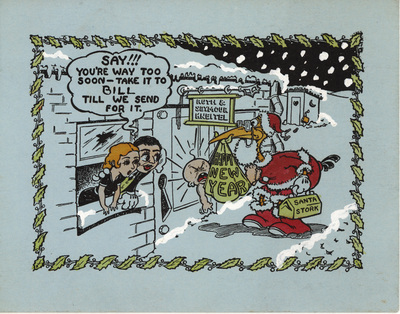 In this card that fold to stand up, Bimbo is carrying a sign with a Christmas greeting. 46: From animator Otto Feuer and family. This drawing is interesting since it shows a typical animators desk of the day with an angled drawing board with a light behind, and shelves to store stacks of completed work. 47: Signed only 'Pauline' might this be Pauline Commonor? 48. 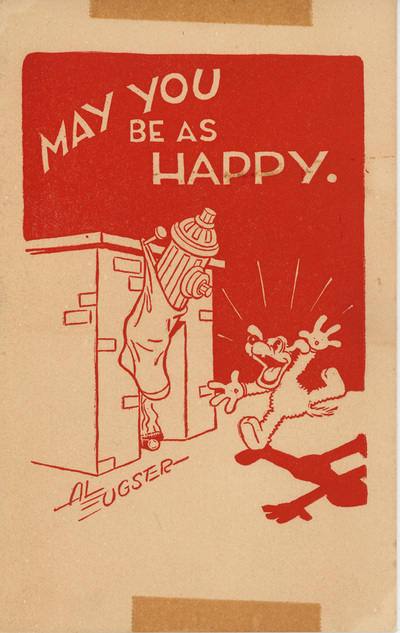 George Rufle started working in animation in 1916, and by 1918 was hired by Barre Studio to work on the Mutt and Jeff series. 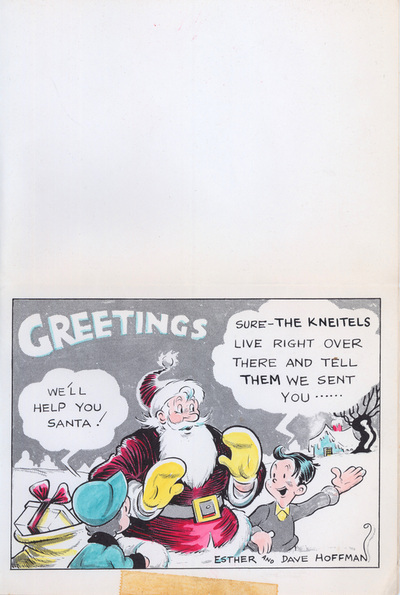 He joined Fleischer Sudios in the early 1930’s, and remained there through it’s transition to Famous Studios, leaving there in 1958. He’s best known for his work animating and driection the entire run of the Tom and Jerry series at Van Buren Studios from 1931-33. 49. This card from Pauline and George Rufle. While working at Fleischer Studios and Famous Studios George Rufle animated many films from the early ‘Out of the Inkwell’ films to Popeye. 50. This card from Pauline and George Rufle cleverly adds the names of the recipients, Ruth and Seymour (Kneitel). 51. 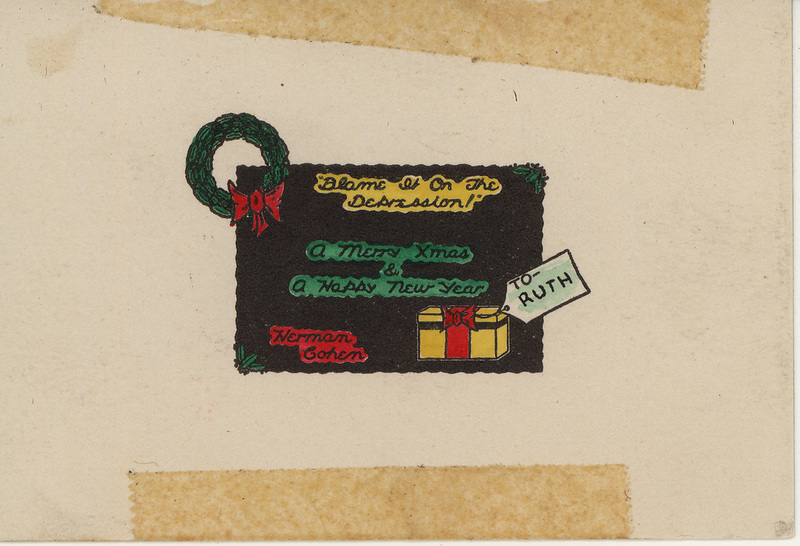 This card from Pauline and George Rufle includes the personalized names of the recipients, Max and Essie Fleischer. 52. Tom Johnson worked as a newspaper cartoonist before joining Fleischer Studios in 1934. He spent his entire animation career with Fleischer Studios and it's successor organization, Famous Studios…. remaining there until 1960. 53. 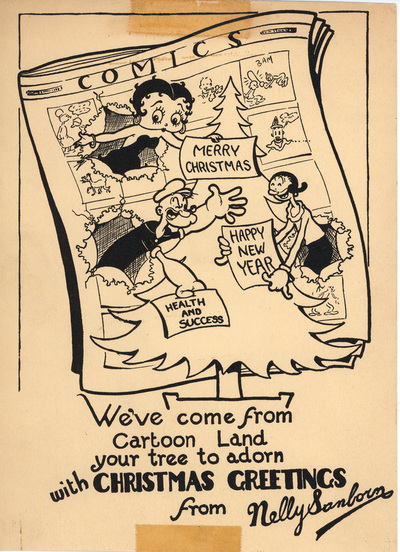 While at Fleischer (and Famous) Studios Tom Johnson animated and developed stories for the 'bouncing ball' films, Betty Boop, Popeye, Mr. Bug, Gulliver, and many others. 54. 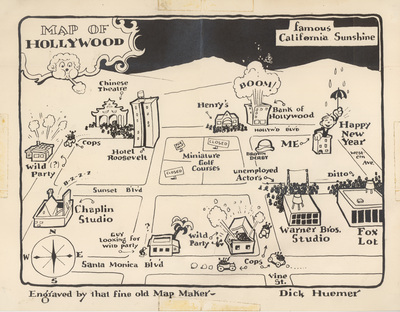 Mariana Butts came to Fleischer Studios in 1930. 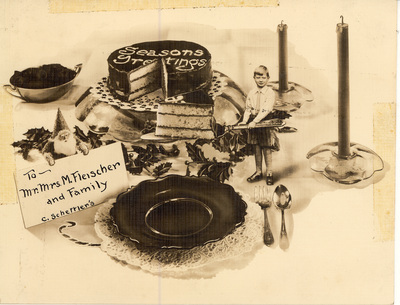 Mariana and Tom Johnson were married Nov. 1934-- another of the many marriages between Fleischer staff. This card features Betty Boop, Ko-Ko and Bimbo. 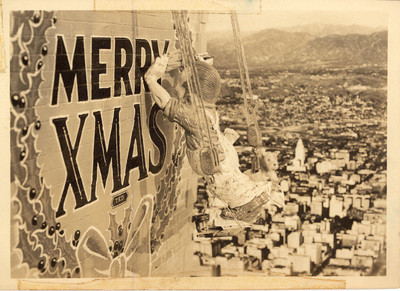 55: Vera Coleman came to Fleischer Studios in 1926 as a typist and telephone operator. She quickly moved into the position of Max’s secretary, and worked with him throughout his career. Vera, shown here with her cat 'Russy,' was known for her great love of cats. 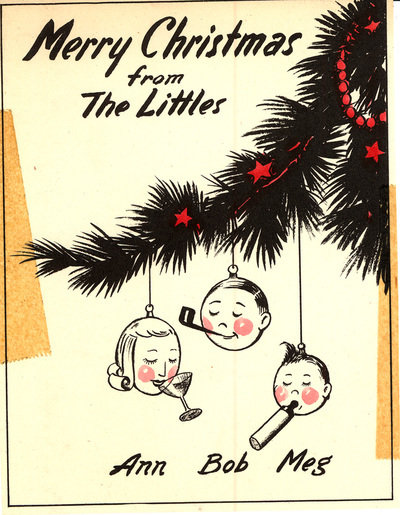 Dated 1940, Florida. 56. 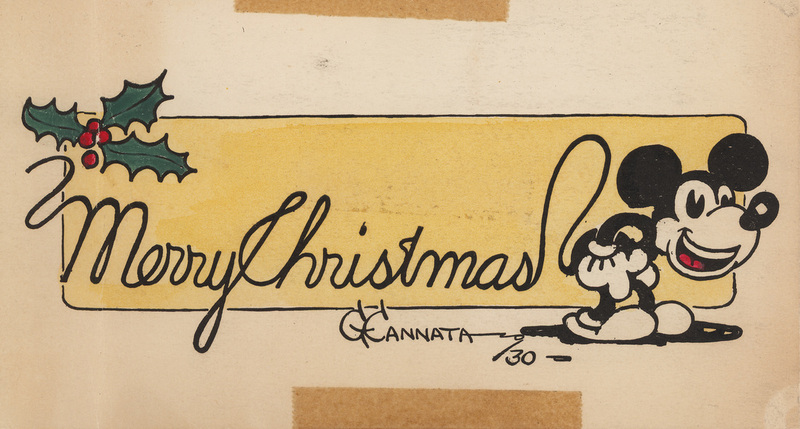 This card is from Dave Hoffman, a Fleischer Studios animator in the 1930's. 57. 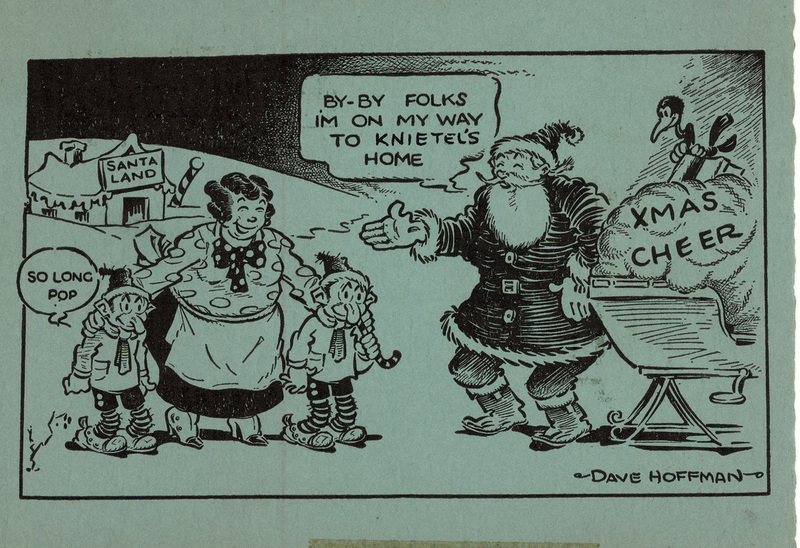 This card by Dave Hoffman shows Santa ready to depart Santaland for the Knietel’s (sic) home. 58. 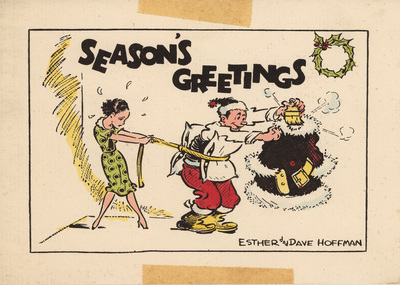 This cards shows Dave Hoffman being helped into his Santa costume by wife Esther. 59. Bob Little was a long time Fleischer staffer responsible for the creation and painting of the backgrounds in Fleischer films. 60. 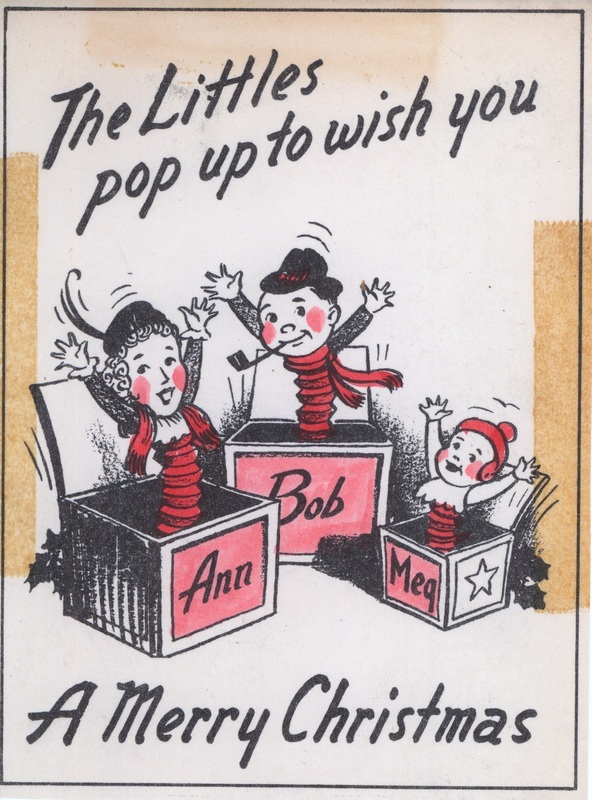 This card from background artist Bob Little includes wife Ann, and baby Meg. 61. Al Eugster’s career began in 1925 in silent films. 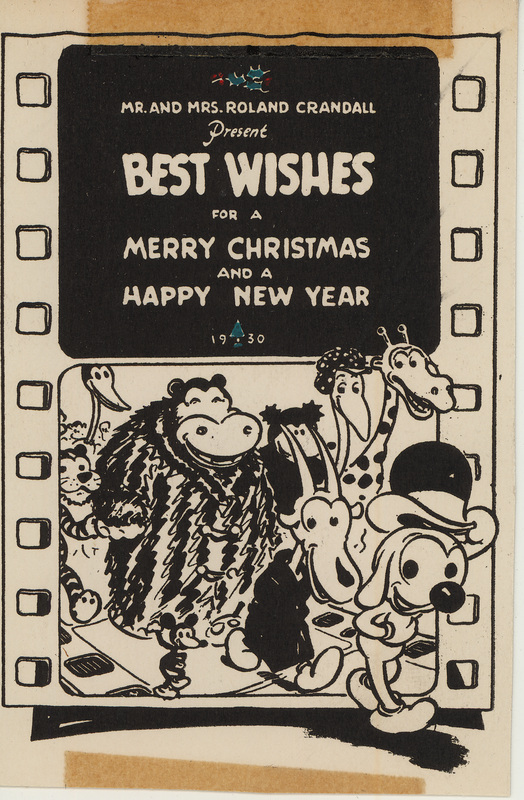 From 1929 to '32 Al worked at Fleischer Studios, where he did his first animation. 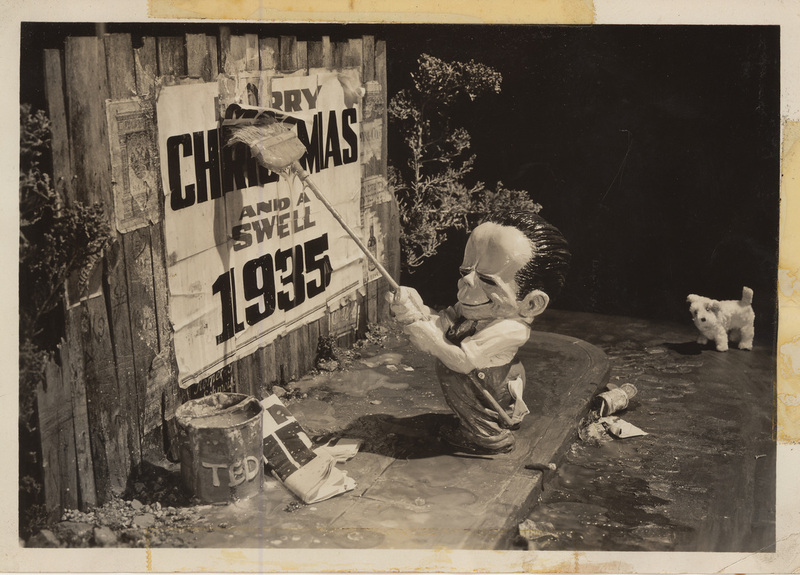 He moved west in 1932, working for several Hollywood Studios (including Disney) before rejoining Fleischer Studios in Florida to work on “Gulliver's Travels.” He also remained to work at Fleischer's successor studio, Famous Studios, until 1957. 64. 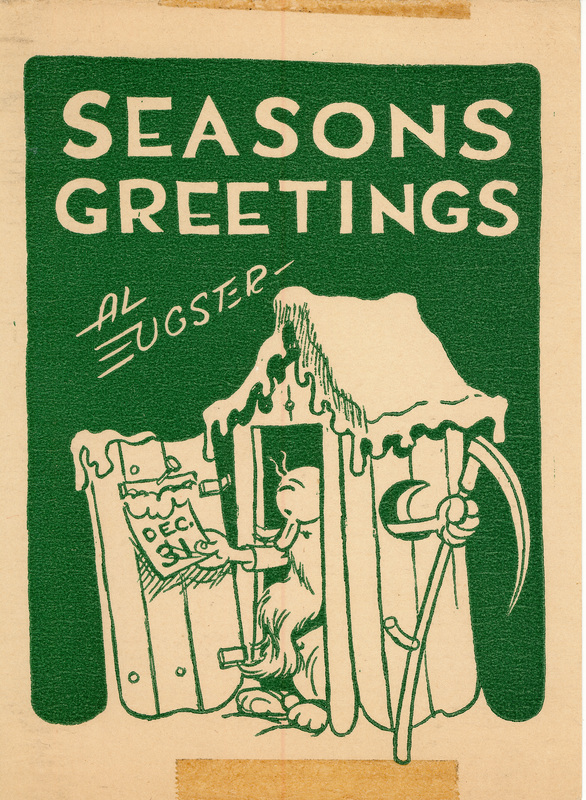 This 1930 card from Al Eugster. 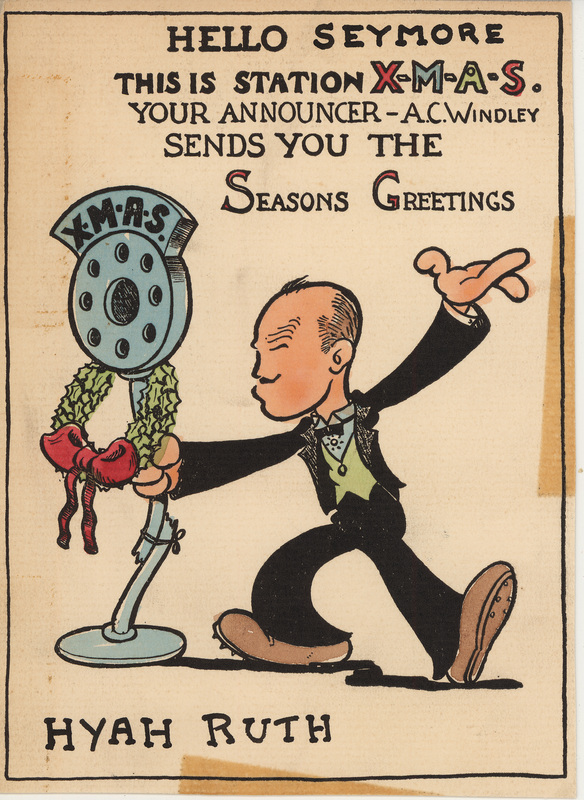 Between his two stints working for the Fleischers, Al worked at several other animation studios, including Mintz Studio, Ub Iweks, and Disney. 65. Signed Chick and Al Eugster. After leaving Famous Studios in 1957 Al free-lanced and worked for Paramount before being hired by Kim and Gifford to animate the very popular 'Science Rock' TV series. When he retired in 1987 he had worked in animation for 62 years, from silent films to TV! 66. 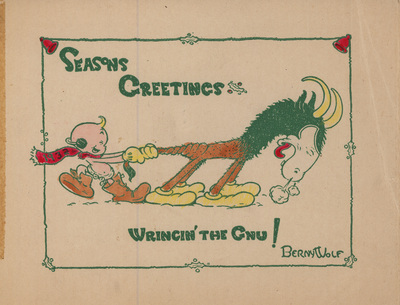 Berny Wolf began a long career in animation in 1924 as an inker for Krazy Kat films. Shortly atfer that he joined Fleischer Studios where he worked on Ko-Ko, Betty Boop, and even rotoscoped the famous scene of Cab Calloway as the ghost Walrus in “Minnie the Moocher.”After leaving Fleischer Studios he worked briefly for Ub Iwerks, before moving to Disney where he worked on “Pinocchio,” “Fantasia,” and “Dumbo.” He continued to work in animation on his own and for others until he retired in the 1980's. 67. 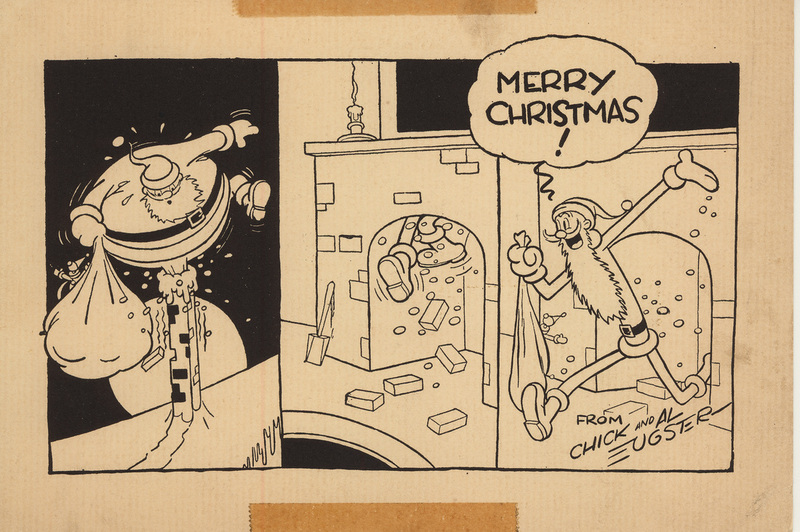 Charlie Biro worked at Fleischer Studios as an assistant animator (1930-32) and animator/director (1932-36). However, the bulk of his career that followed this was in writing and creating comic book characters and art. He became well known in the comic book field for his crime and action stories. 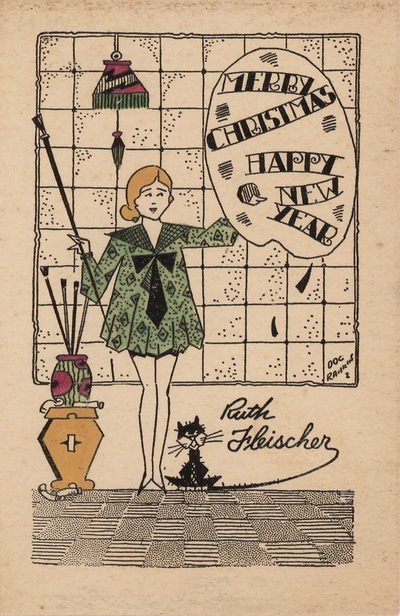 This card dated 1931. 68. 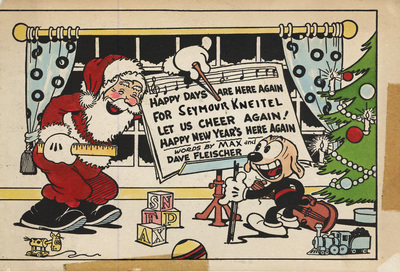 Charlie Schettler, known for creating many of the wonderful effects in Fleischer cartoons, was the very first employee hired by Max and Dave. 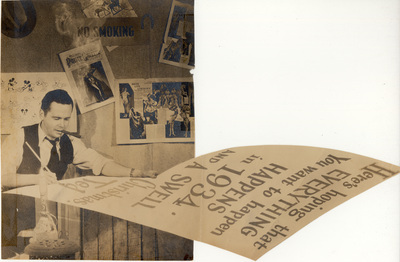 Many of the effects and illusions of depth in the Fleischer films were due to the genius of Charlie Schettler and his camera work. 69. This unusual card is from Charlie Shettler, known for his creative camera work. 70. 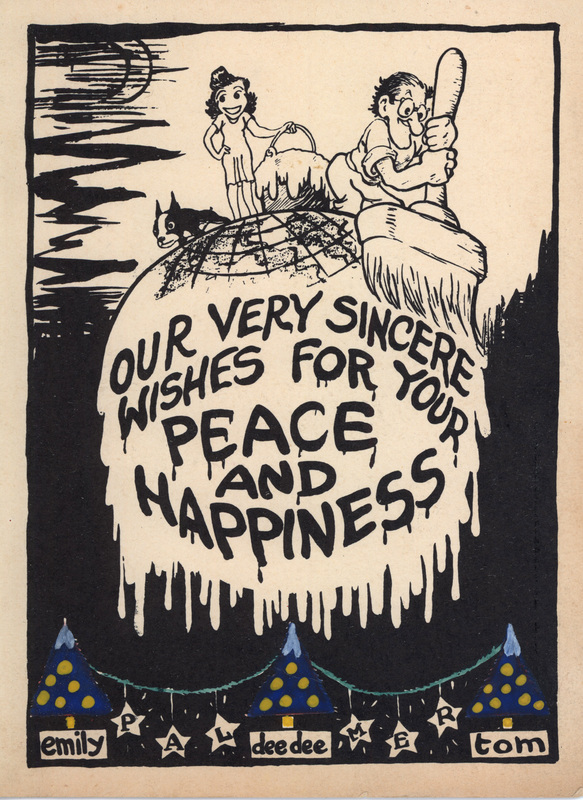 This card from the Charlie Shettler family. 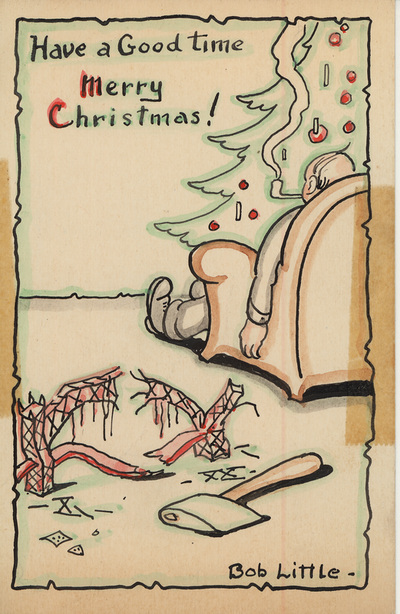 Often these Christmas cards reflected something about the person who created them. In the case of Charlie’s cards one can see his interest and skill in merging photographic images. 71. 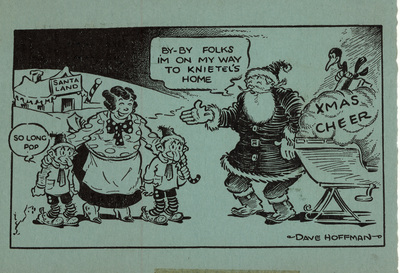 This 1933 card showing an exhuberant Santa is from Jack Willis. 72. 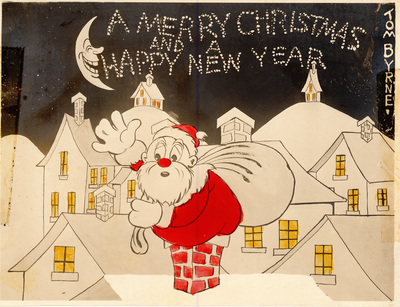 In the late 1920’s through 1930 Ted Sears worked as an animator at Fleischer Studios. 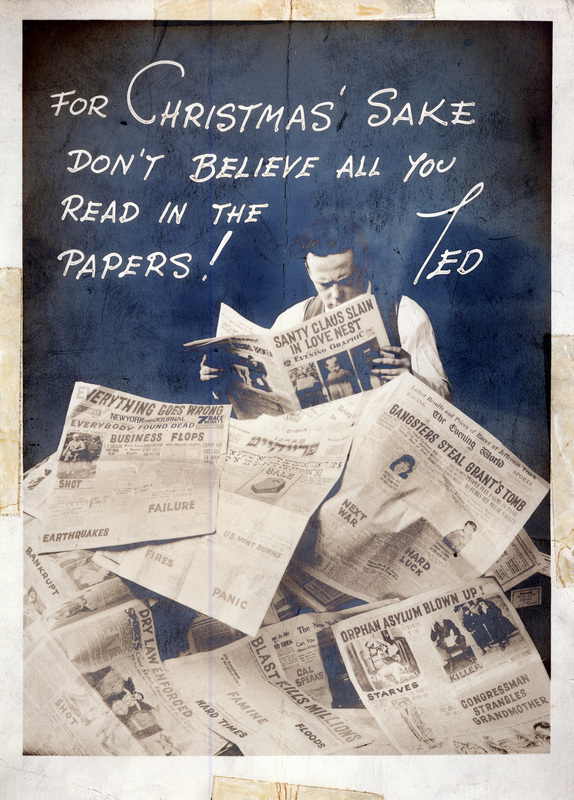 In addition to animating, Ted also contributed many story ideas. His natural ability in story development led to his being hired in 1931 as the first head of the Disney Story Departent, where he stayed for 27 years writing for “Snow White,” “Fantasia,” “Cinderella,”and virtually every major Disney production. 73. 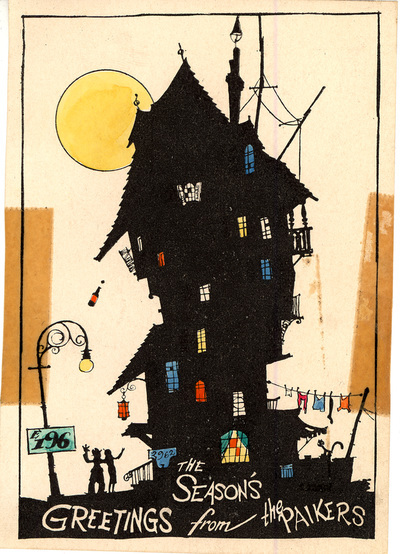 Before he began work for the Fleischers, Ted Sears began his film career by making props, lettering title cards for for silent films, and working with trick photography. 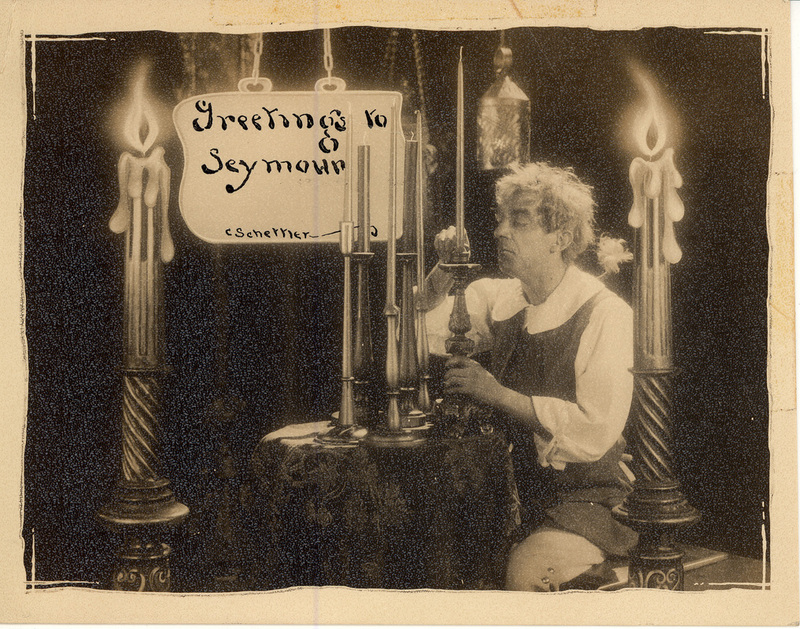 His interest in those special effects is reflected in his Christmas cards. 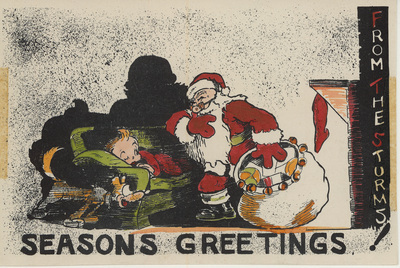 This card dated 1934. 74. Ted Sears’ Christmas cards were known for their elaborate set-ups using collages, props, and sets. This card dated 1935. 75. 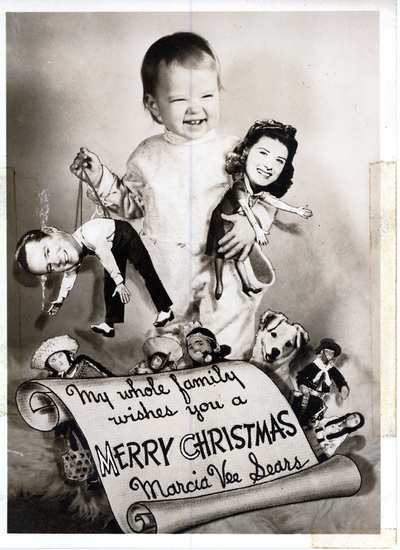 This is another of Ted Sears elaborate set-ups for a Christmas card showing his love for trick photography and special effects. 76. 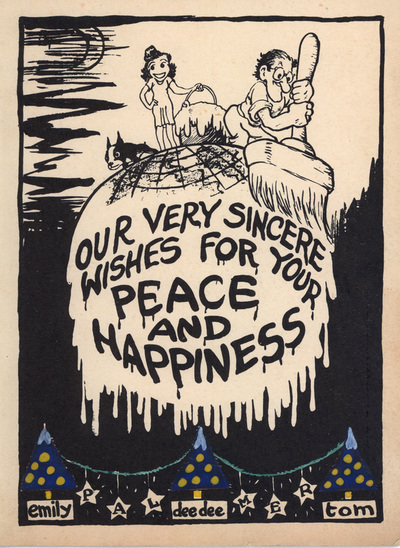 This card from the Ted Sears family. 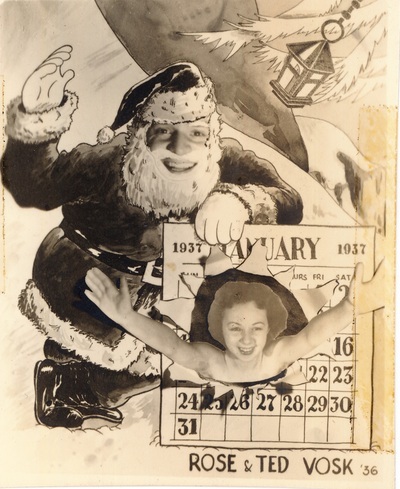 Typically Ted has created a photographic collage, and included his wife and daughter. 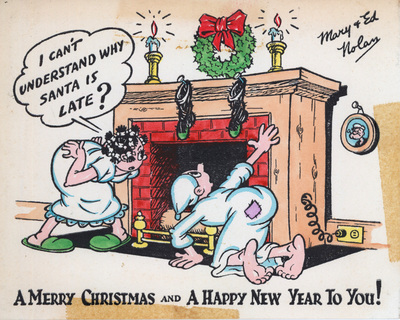 77: This card from Tom Byrne shows Santa having a tough time with the chimney. 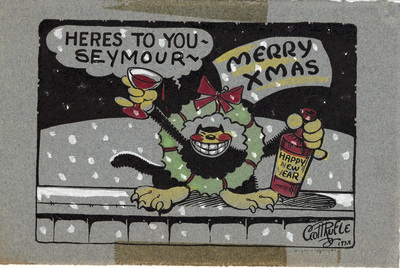 78: From assistant animator Ellsworth Barthen, who went on to provide animation for many TV series. Ellsworth has depicted himself flying a plane (to Miami?) dressed as Popeye. 79: A card from Orestes, Margy and Lee Calpini. 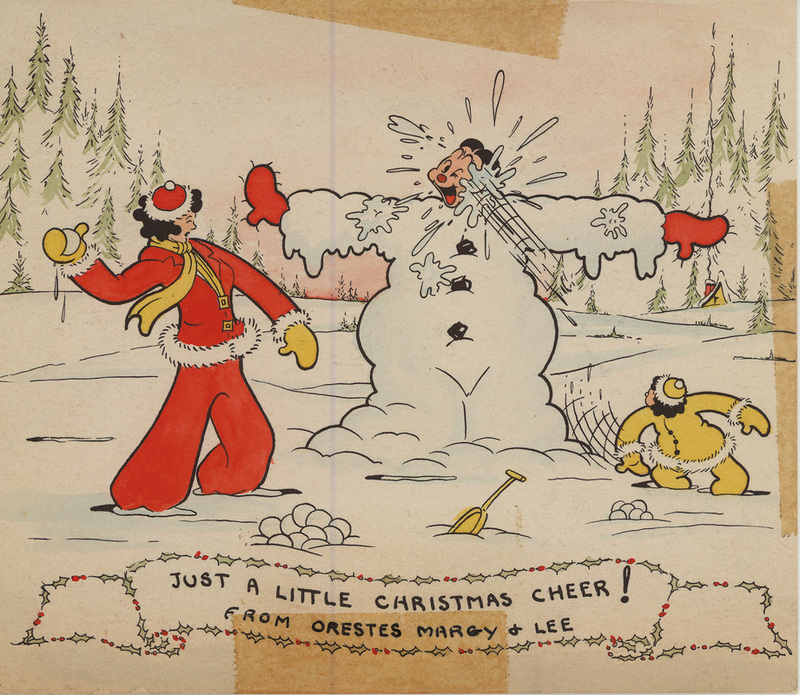 Orestes had his start at Fleischer Studios, continued with Famous Studios, and later became a comic book artist. 82. 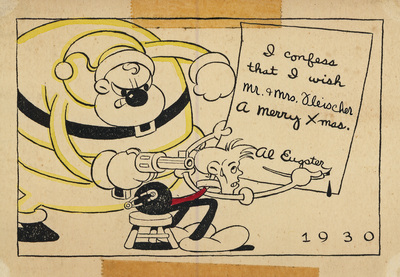 Don Figlozzi (aka Figliozzi) was an animator who joined Fleischer Studios in 1931. After leaving the studio he became a cartoonist for the New York Daily News (signing his name ‘Fig’). During WWII he worked on training films for the Army Signal Corps, and later became one of the earliest animators working in TV. 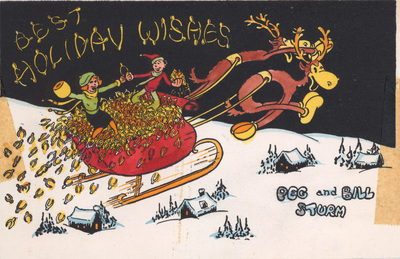 This card dated 1935. 83. This card from Millie Figlozzi. 84. 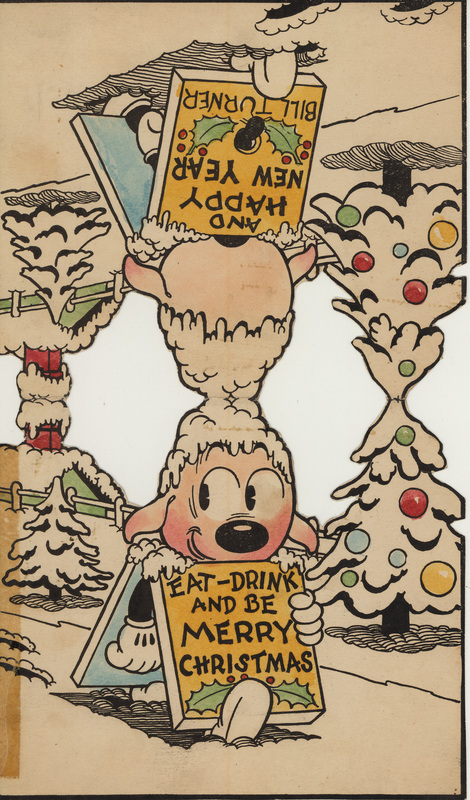 Working first for Bray Studios at age 16, by the 1930's Frank Paiker was inking and coloring cells at Fleischer Studios, where he eventually became Head of the Coloring Department. He later went on to a long career in animation that included working at MGM and serving as head of the Camera Department at Hanna-Barbera. 85. 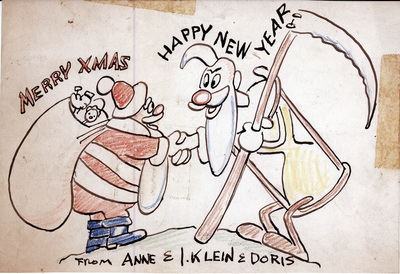 From Ann and Izzie Klein and Doris. Izzie Klein was a story man at Fleischer Studios and apparently was one of the first cartoonists at the New Yorker, as well as working later for Disney. This card completely hand drawn as well as hand-colored. 86. Mystery card-- who is "R.J.S."??? If you know, then drop us an email - we'd love to know! 87. 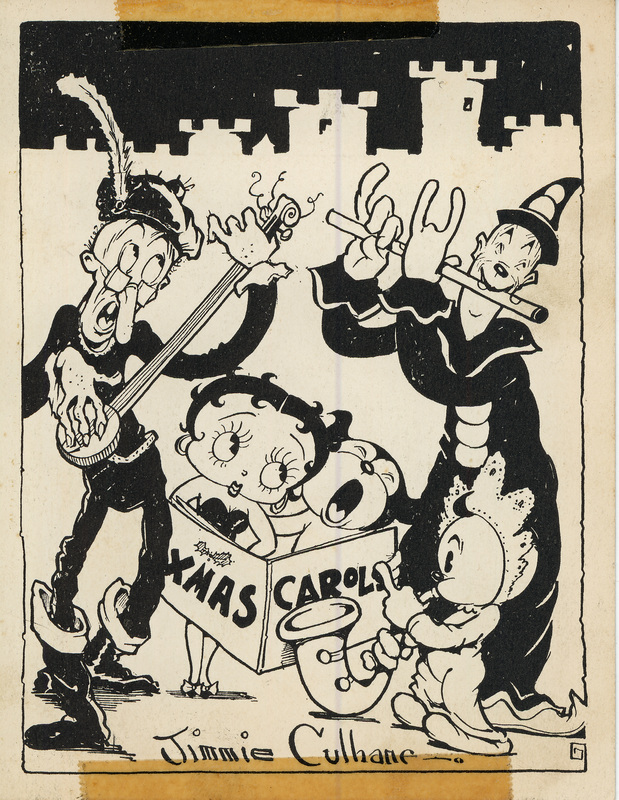 From Violet (Vee) and Ted Sears, dated 1937. This card must be before their baby, Marcie, was born. After the baby arrives she is featured in the Christmas cards. Before coming to work for Fleischer Studios, Ted worked in silent films where he lettered title slides, made props and worked with trick photography. Most all his Christmas cards use photography as well as elaborate set-ups using his family. 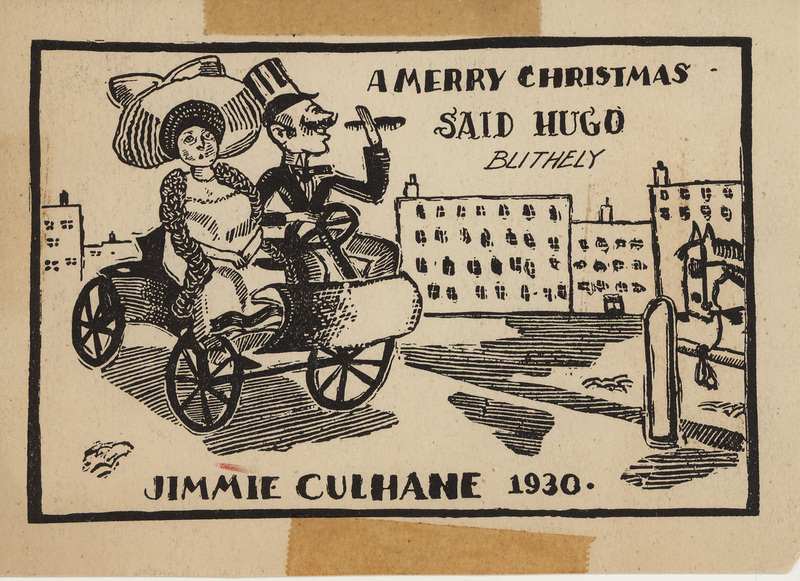 In this card he has fun with some of the article titles…’Wedding is held in Butcher Shop’…’Sanity Restored by Strange Drug’… sounds like an animator! 88. 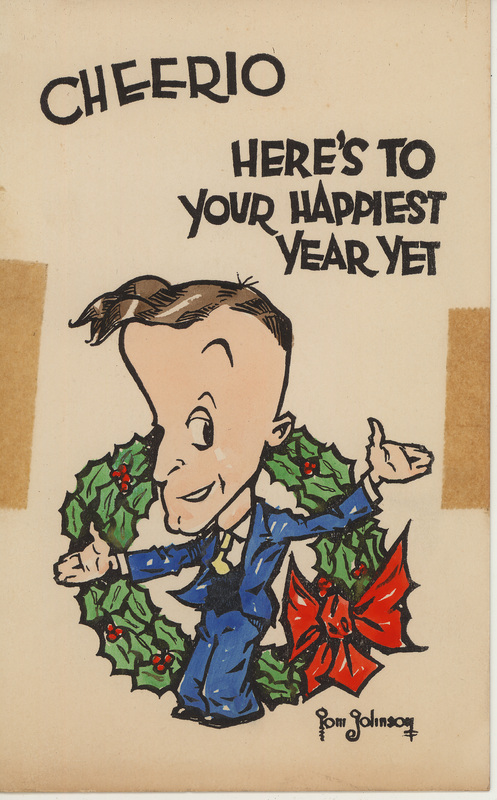 This card is from Ted Sears, his wife Vee, and daughter Marcia. 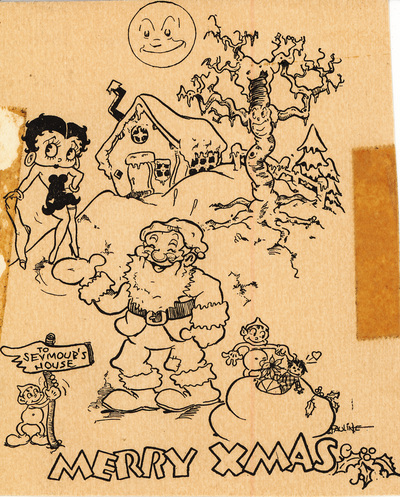 From the late 1920’s through 1930, Ted Sears worked for Fleischer Studios as an animator. 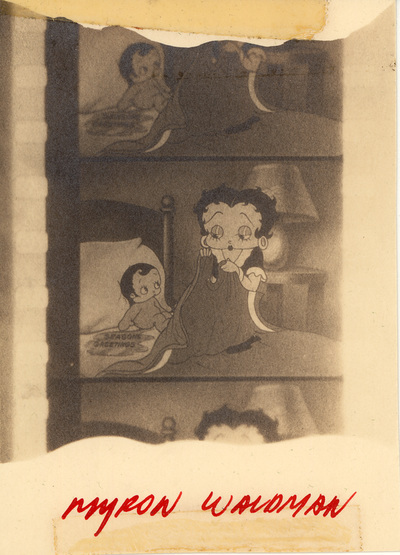 In fact Ted Sears was a head animator on “Dizzy Dishes,” Betty Boop’s first film. In addition to animation, Ted contributed many clever story ideas to the studio. In 1931, he was hired away by Disney to become the first head of their story department. He stayed at Disney for many years doing story work on such films as “Snow White,” “Cinderella,” “Sleeping Beauty” and many other well-known films. 90. This rare card from a woman is from Dot Loth. Dot appears to be holding a bag with Betty, Ko-Ko and Bimbo. It’s possible that Dot was in the inking or painting department. 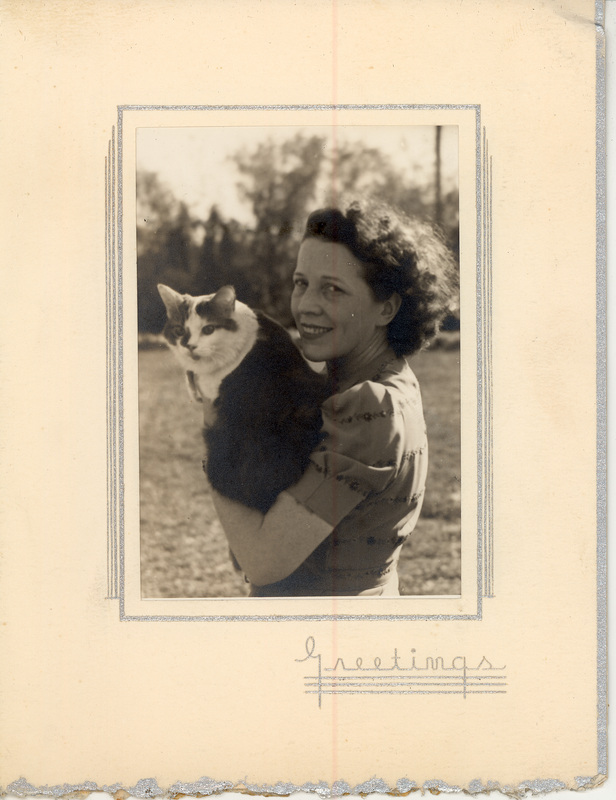 Is there a relative of Dot’s out there who can give us some information? 92. From Peg and Bill Sturm. 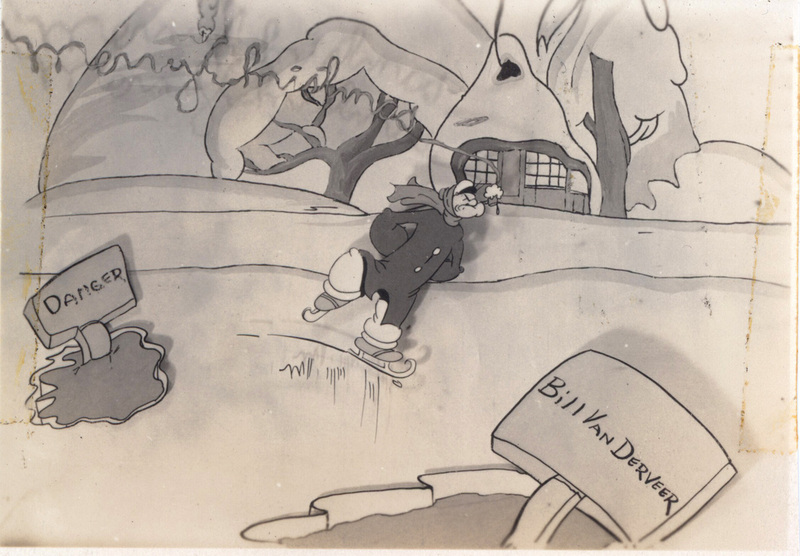 Bill was a Fleischer Studios animator, and head animator, most noted for character development. He apparently did a lot of animation for the Popeye and Bluto characters. Bill left Fleischer Studios in 1938 to work for Bob Clampett at Warner Brothers. 93. 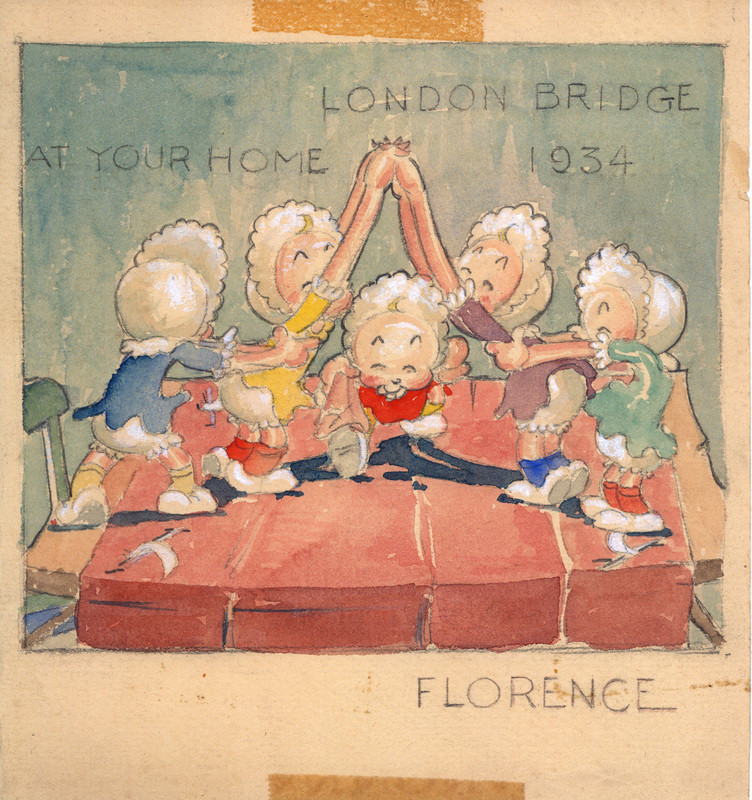 This beautiful little 1934 hand-painted watercolor card is signed only ‘Florence.’ I’d love to know more about who Florence is… if anyone knows. Since only men were animators at that time, I’m guessing Florence might have been a Fleischer inker or painter. 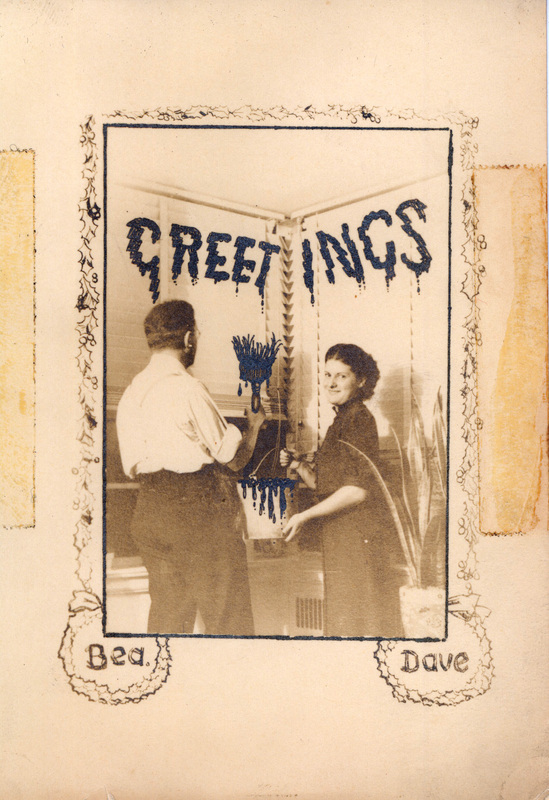 94 - A: This is the front of a card from Esther and Dave Hoffman. 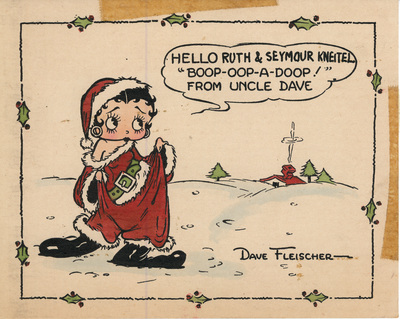 Dave was a Fleischer Studios animator in the 1930’s. He worked on films featuring Betty Boop, Wiffle Piffle, and even the famous Fleischer ‘Bouncing Ball.’ When he left Fleischer Studios in the late 1930’s, he animated Porky Pig under Bob Clampett and Looney Tunes. By the 1960’s, Dave was doing work for TV that included Spider-Man and Crusader Rabbit. 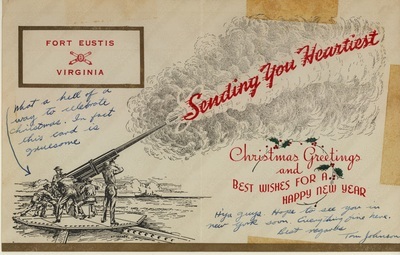 The following image is of the inside of the card. 94-B: This in the inside of a card from Esther and Dave Hoffman. 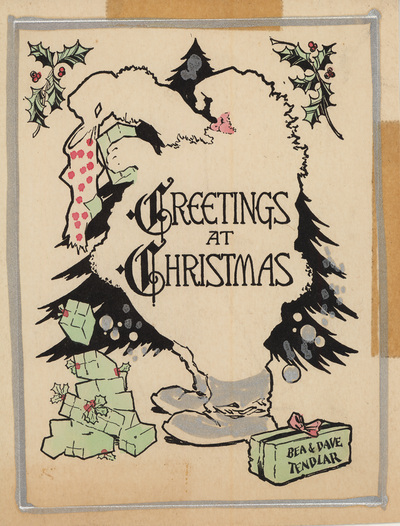 The previous image is the front of the card. 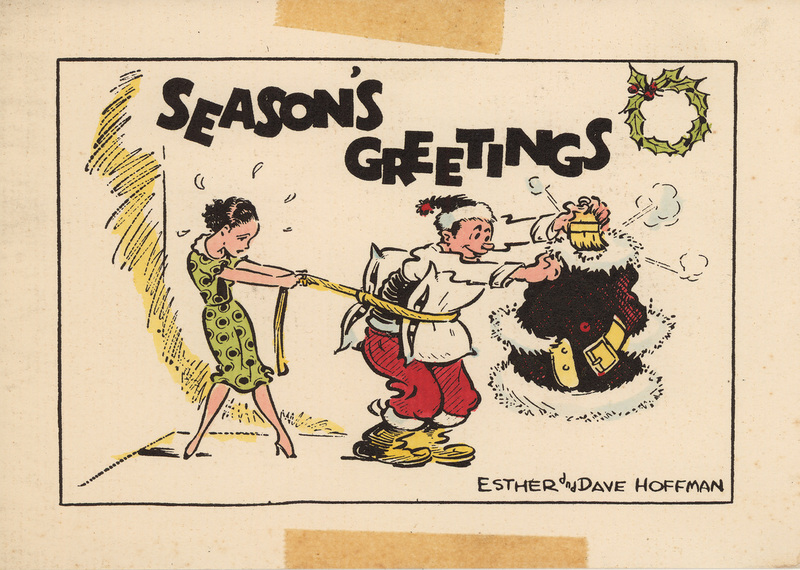 Dave was a Fleischer Studios animator in the 1930’s. 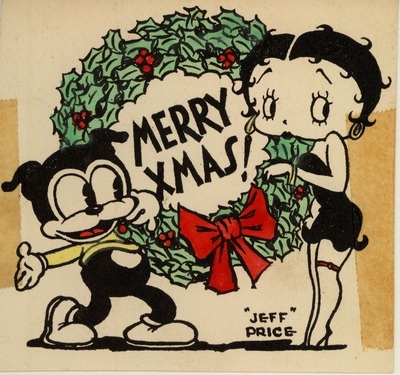 He worked on films featuring Betty Boop, Wiffle Piffle, and even the famous Fleischer ‘Bouncing Ball.’ When he left Fleischer Studios in the late 1930’s, he animated Porky Pig under Bob Clampett and Looney Tunes. By the 1960’s, Dave was doing work for TV that included Spider-Man and Crusader Rabbit. 96. 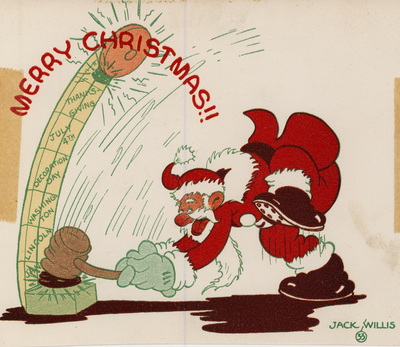 This card by Bill Van Derveer shows Popeye ice-skating. We can’t find any information on Bill so it’s not clear what his position in the Studios might have been. 97. Milton Nadel has shown himself hanging out with Olive and Popeye. Another person we need some information on! 98. This card is from the Charles Schettler’s family. Charles was the very first employee hired by Max and Dave. 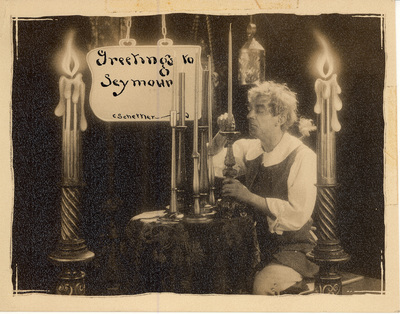 He was responsible for creating many of the wonderful visual effects on film. Many of the effects and illusions of depth in the Fleischer films are due to the genius of his camera work. 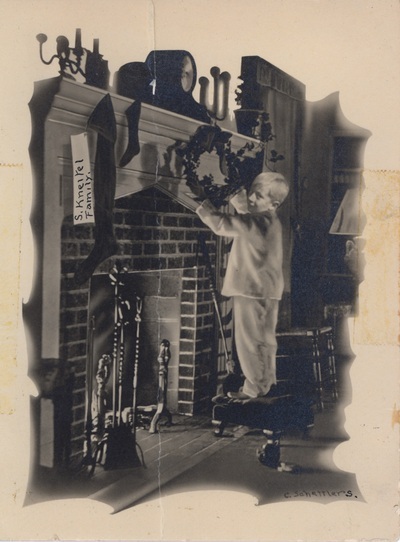 His yearly Christmas cards all feature photographic effects. 99. Here’s a card from Bob Little, wife Ann, and daughter Meg. 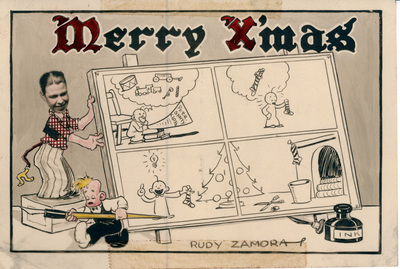 Bob was a long time Fleischer staffer who was well known for the creation and painting of backgrounds. His Christmas cards tend to feature his family. 100. 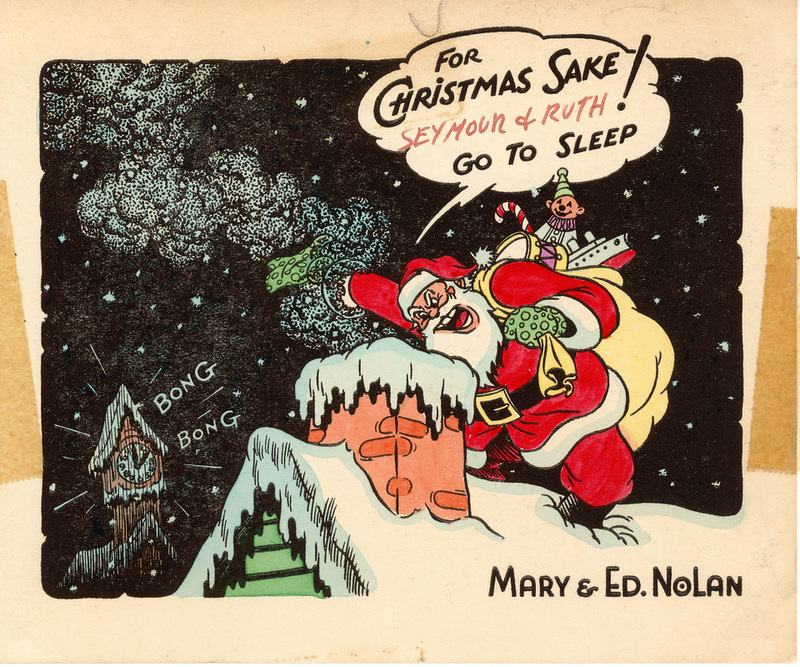 Here’s a card from Mary and Ed Nolan. They met while both were working at the Studio. Ed worked on many different films, including Popeye… in fact, to the right of the fireplace Ed included a small picture of Popeye himself! Help us out! If you have any additional information about any of the cards included in this exhibit or the artists who created them (especially for those cards for which we have little information), let us know by emailing us at info@fleischerstudios.com. 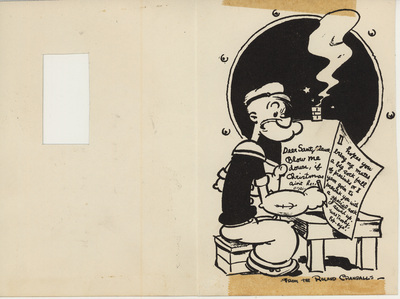 POPEYE and OLIVE OYL © 2014 King Features Syndicate, Inc.